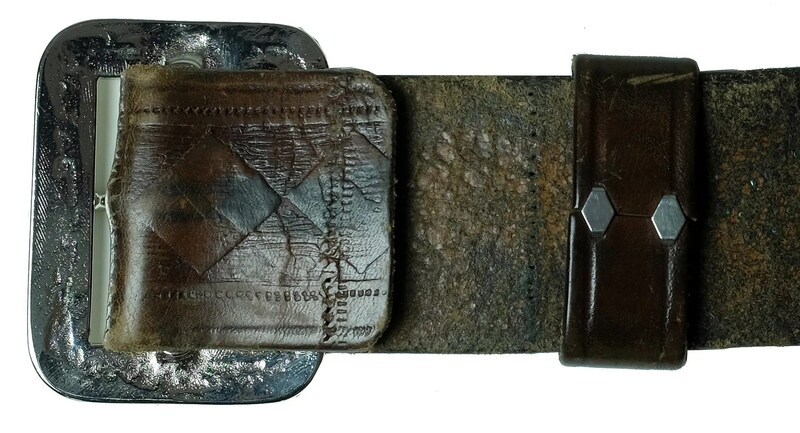 This vintage belt was made in the mid-late 1930s. 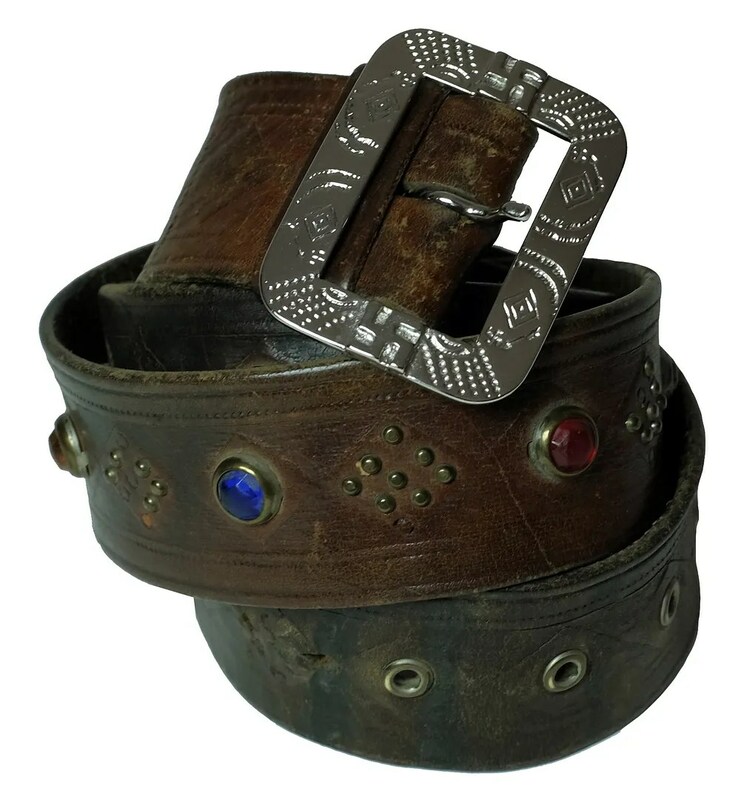 It is tooled with a diamond pattern with alternating diamond clusters of small studs and colored jewels. 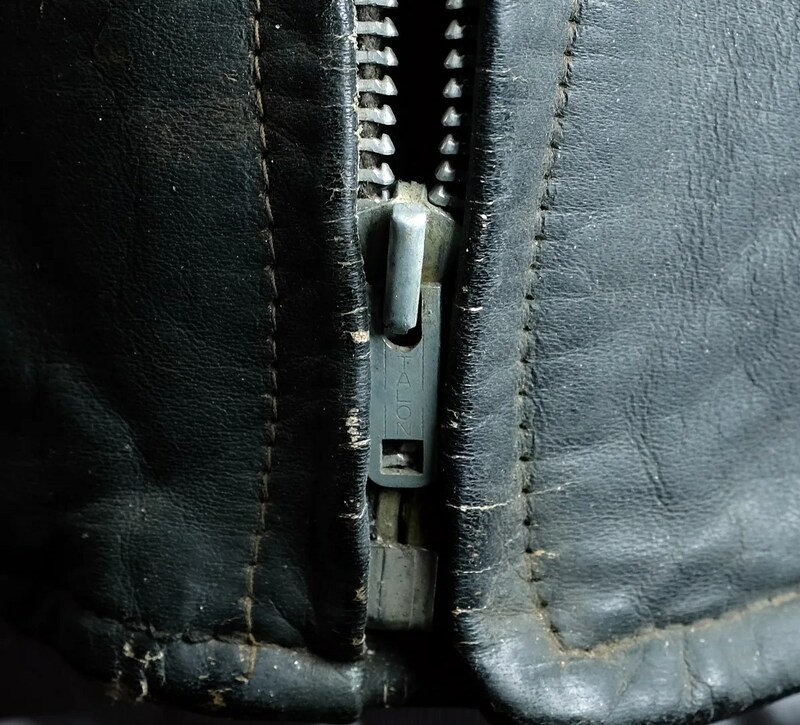 The belt holes are grommets and there is a tooled keeper. 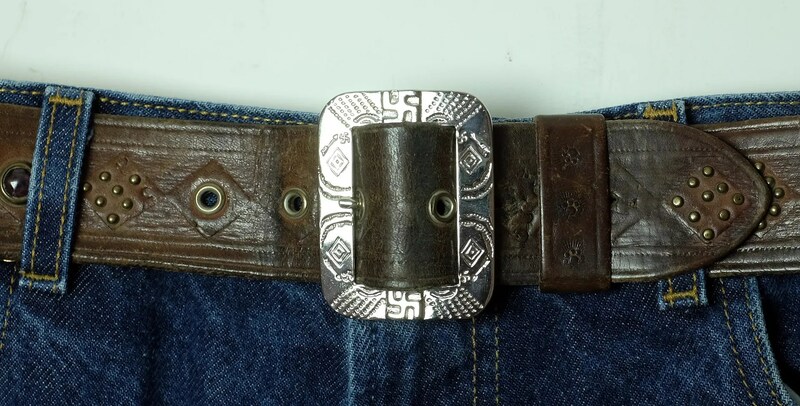 The original belt buckle was missing when I bought the belt and I have added a Japanese reproduction buckle with a whirling logs motif, which is close to what this would have had when new. 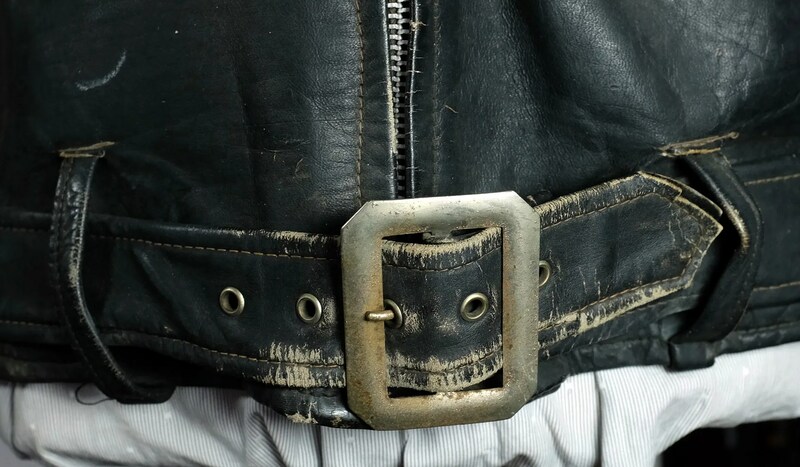 The loop for the buckle needs to be re-stitched, at some point before I got it, the original buckle was removed and the belt was re-stitched to a smaller position, indicating multiple owners over its lifetime, as someone else has punched additional holes in the end of the belt to expand it. 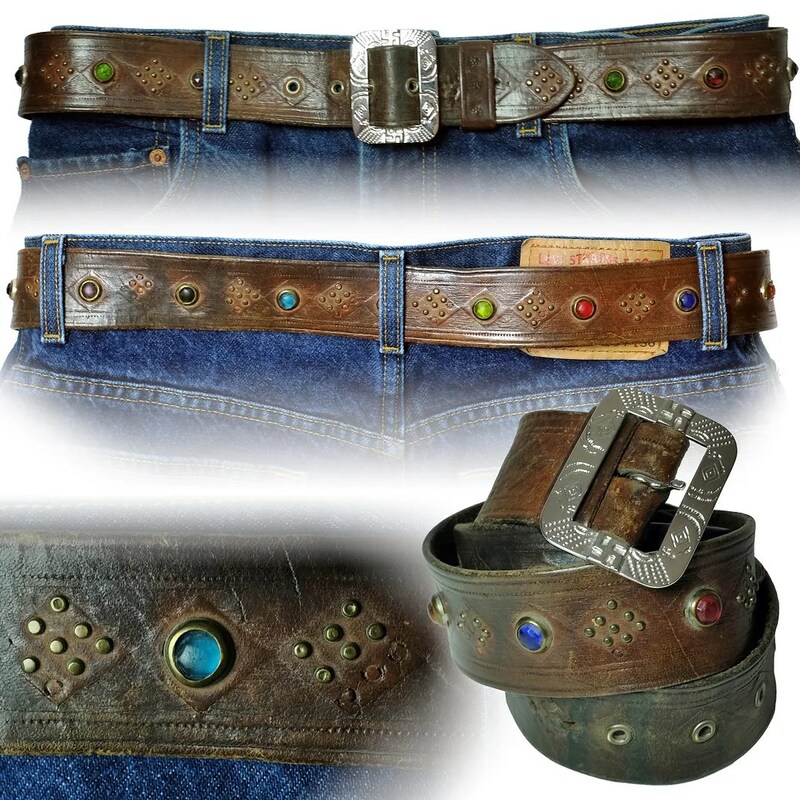 The belt measures 34″ to the smallest hole, 37″ to the largest grommet, and 39 to the last informal (punched later) hole. 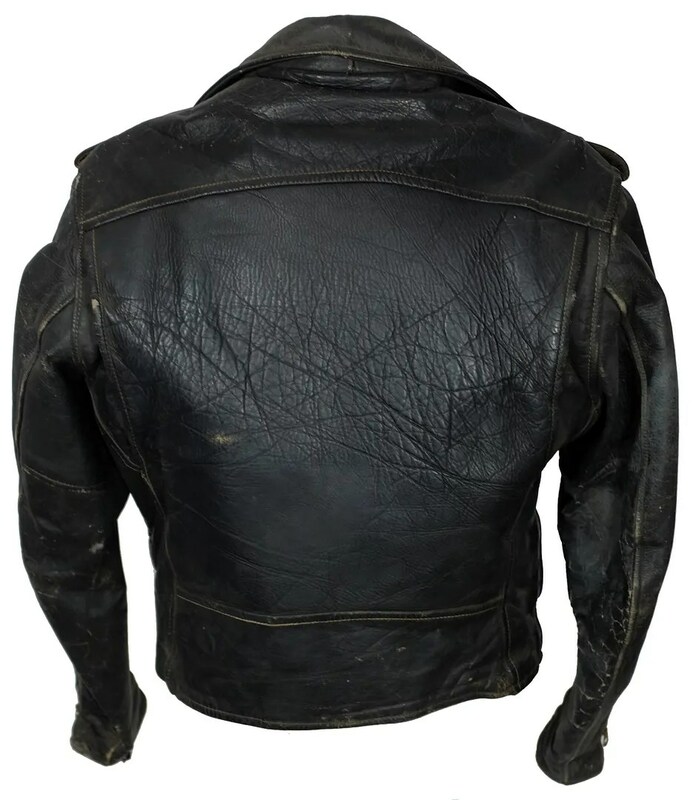 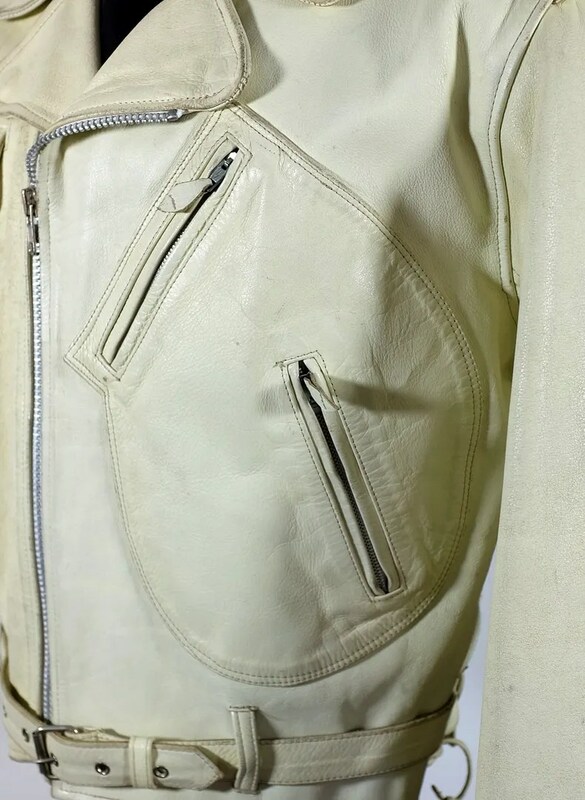 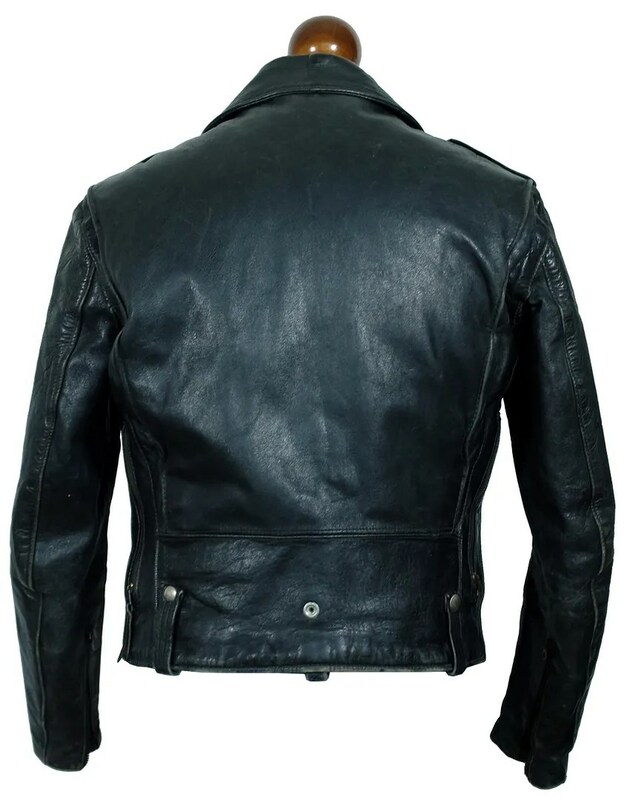 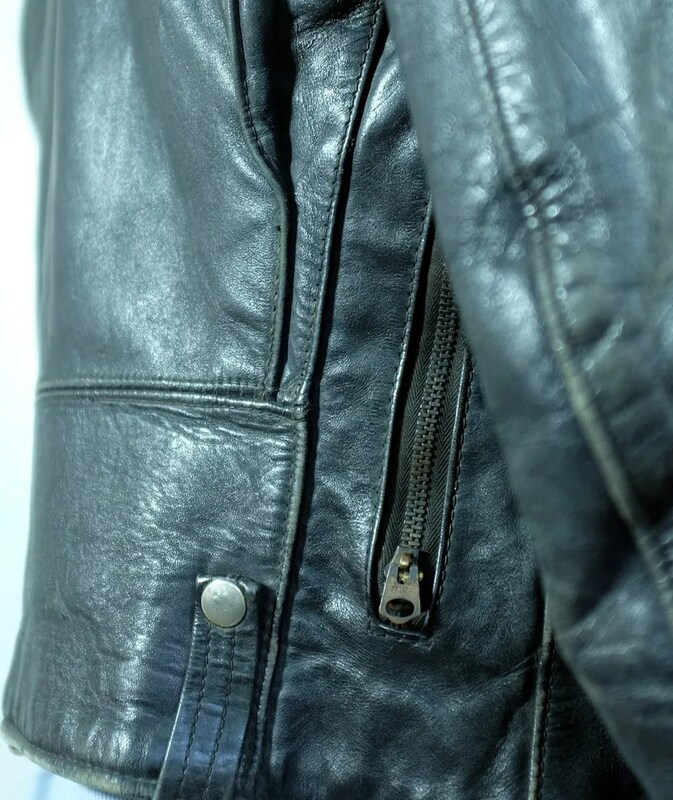 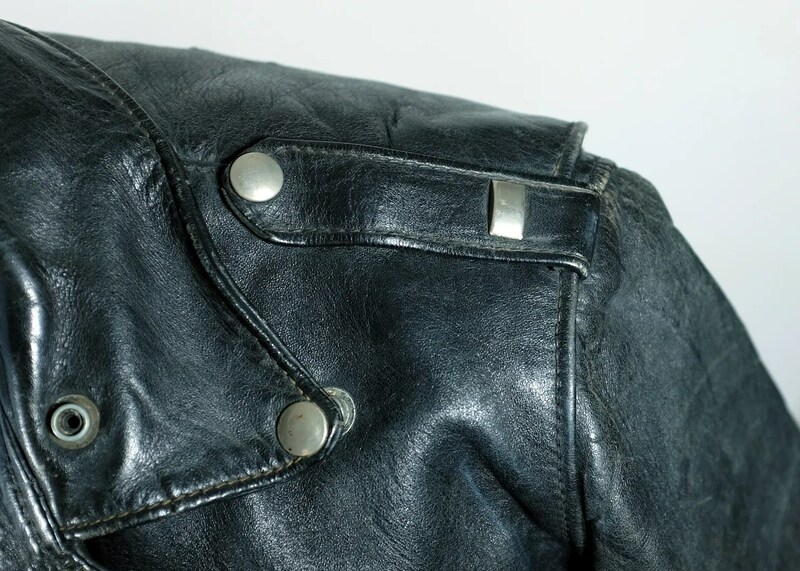 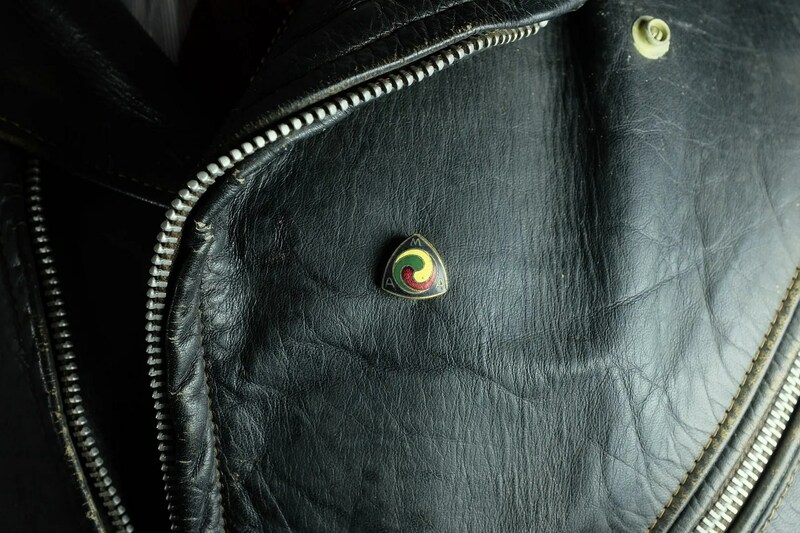 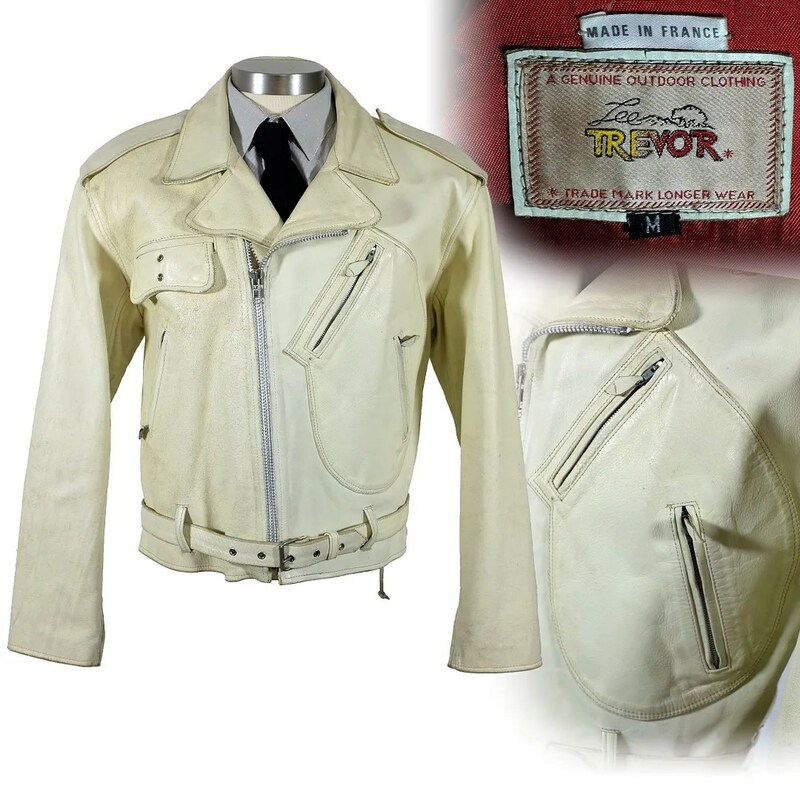 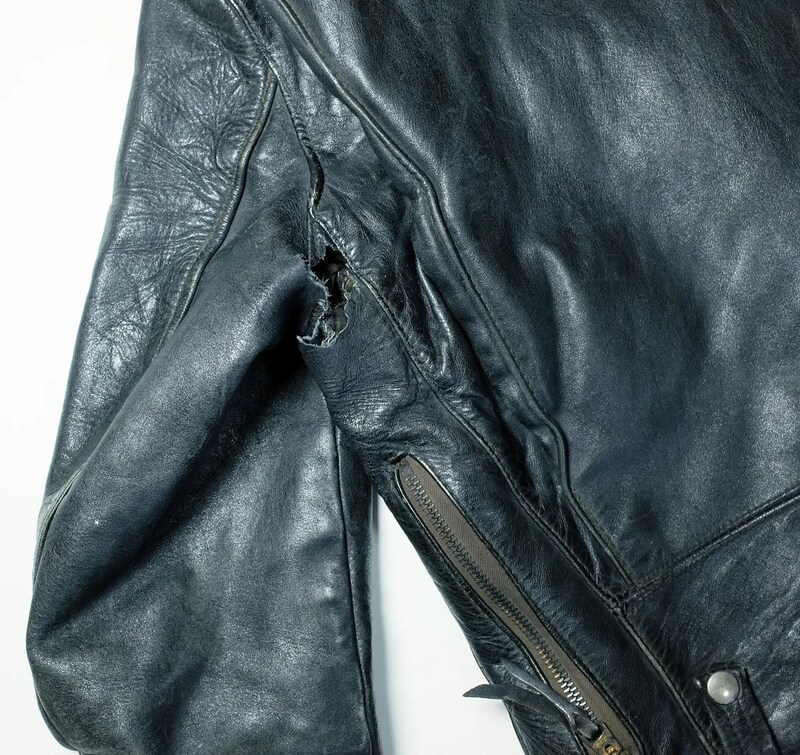 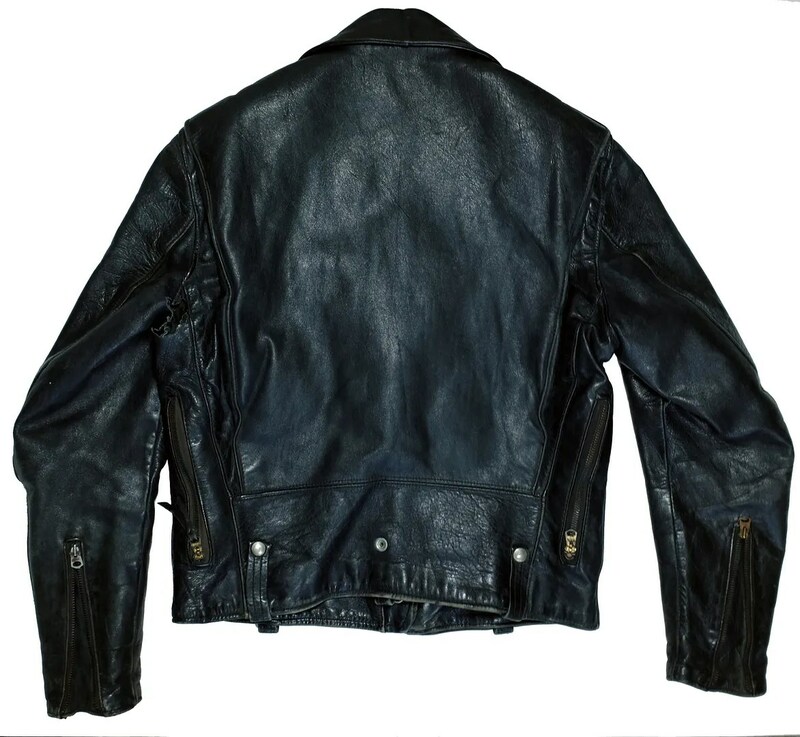 This vintage leather jacket was made in the early 1950s. 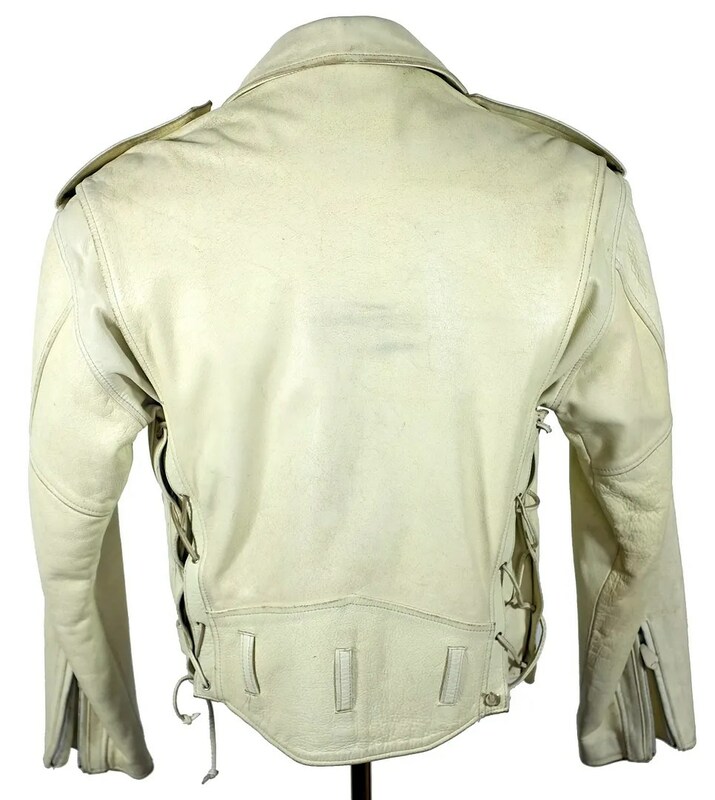 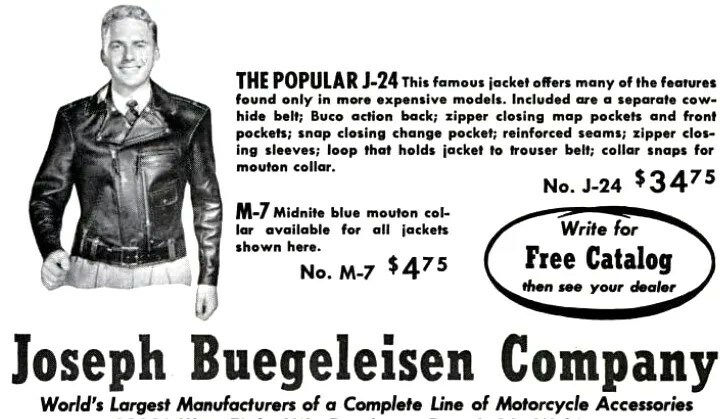 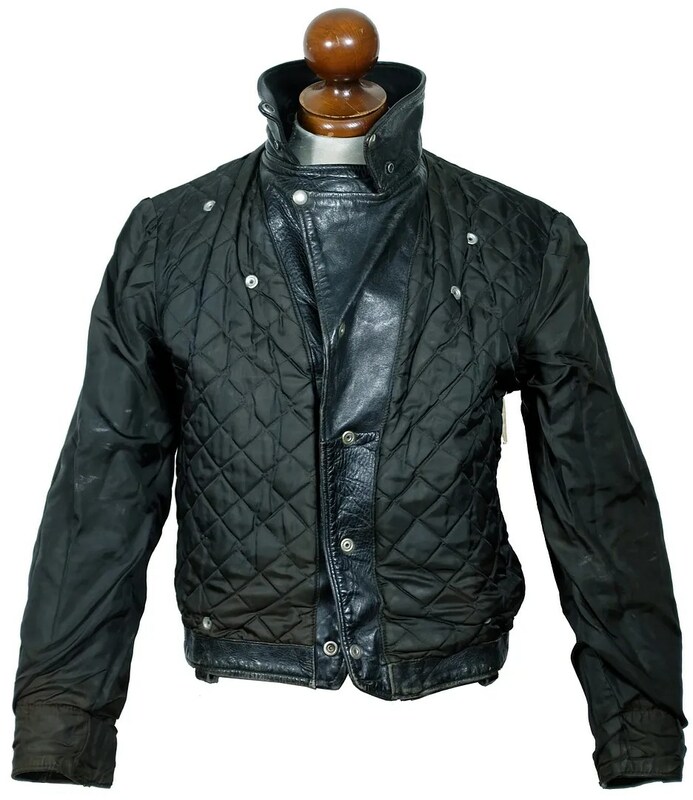 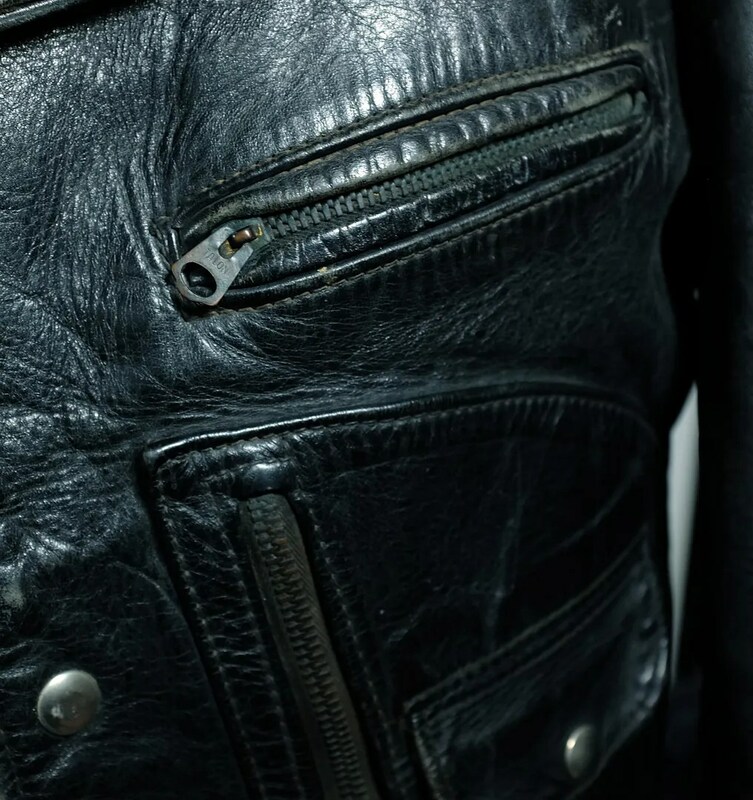 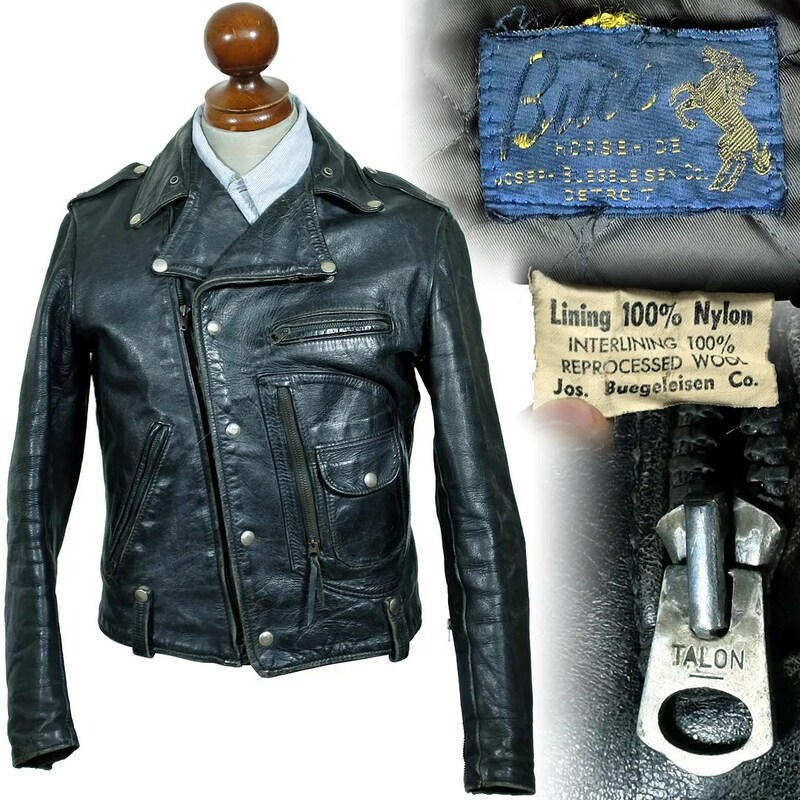 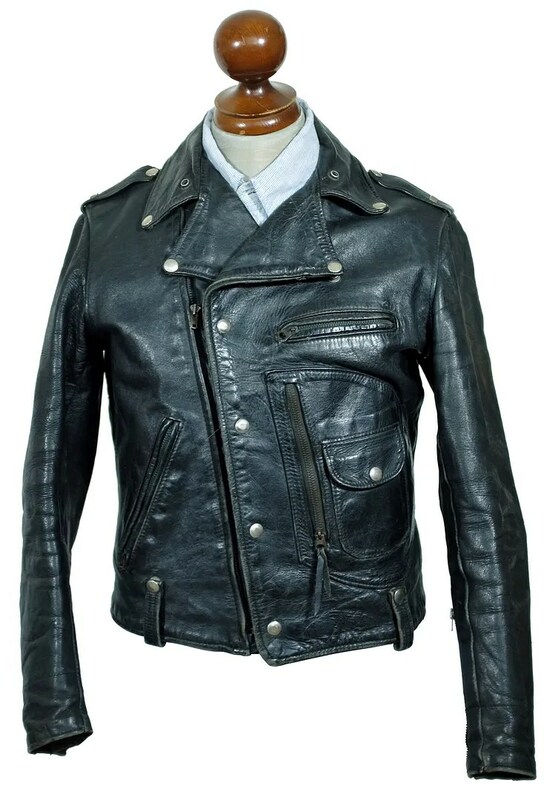 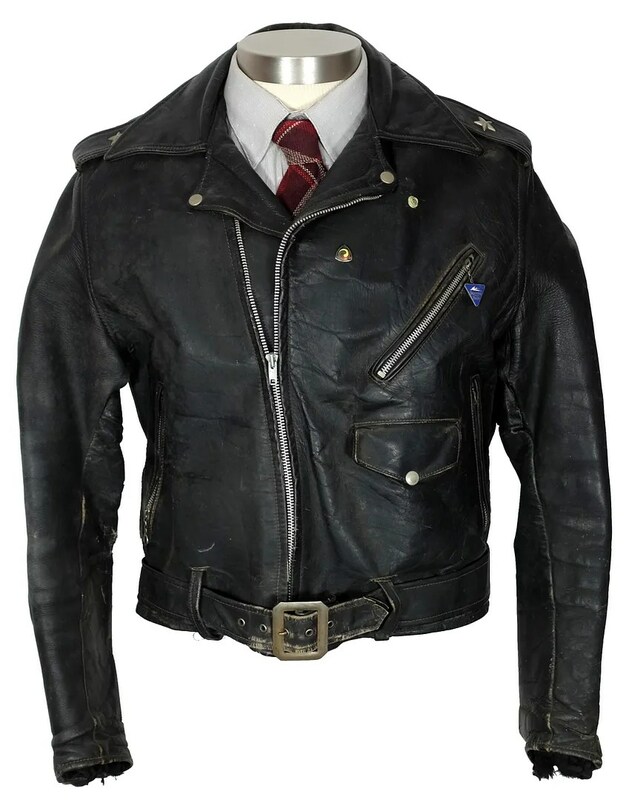 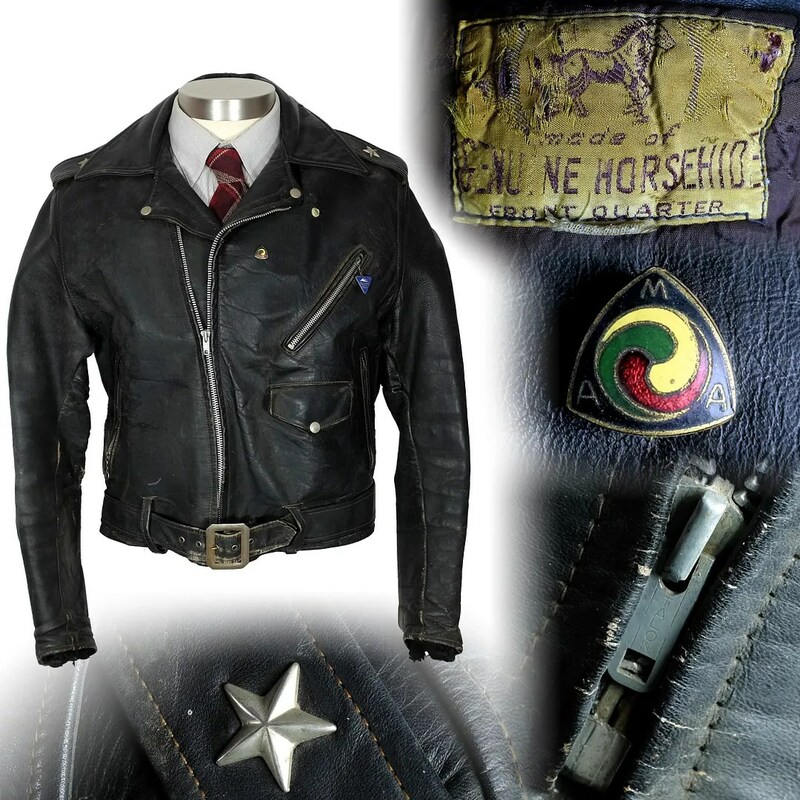 It is made of Front Quarter Horsehide, in a classic motorcycle jacket cut, with an offset zipper, cigarette pocket, handwarmer pockets, epaulettes, belted waist and chest pocket. 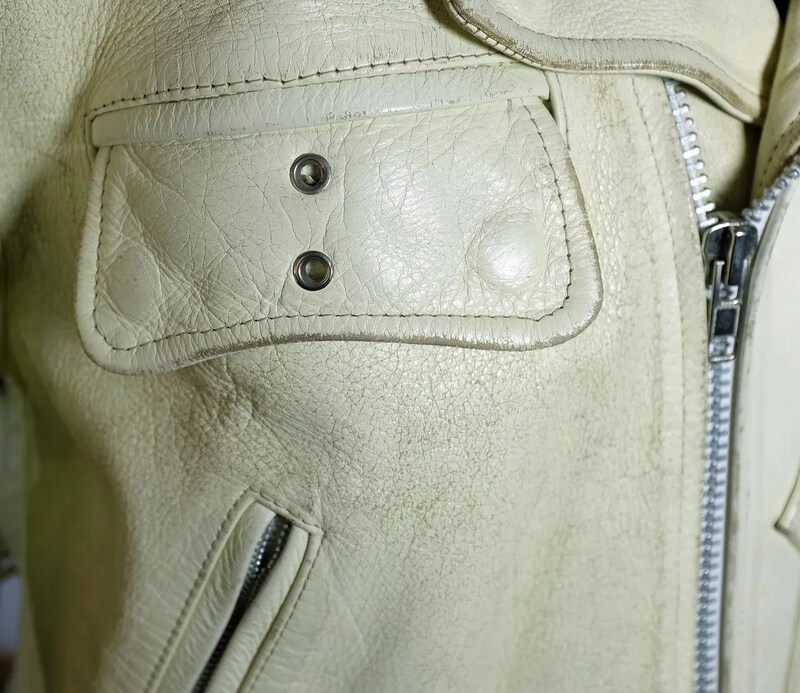 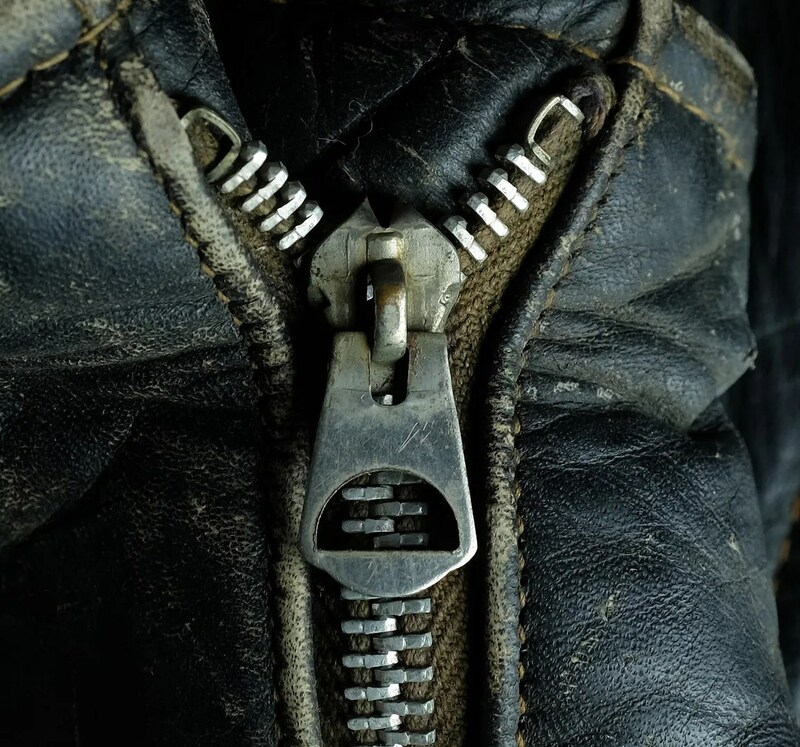 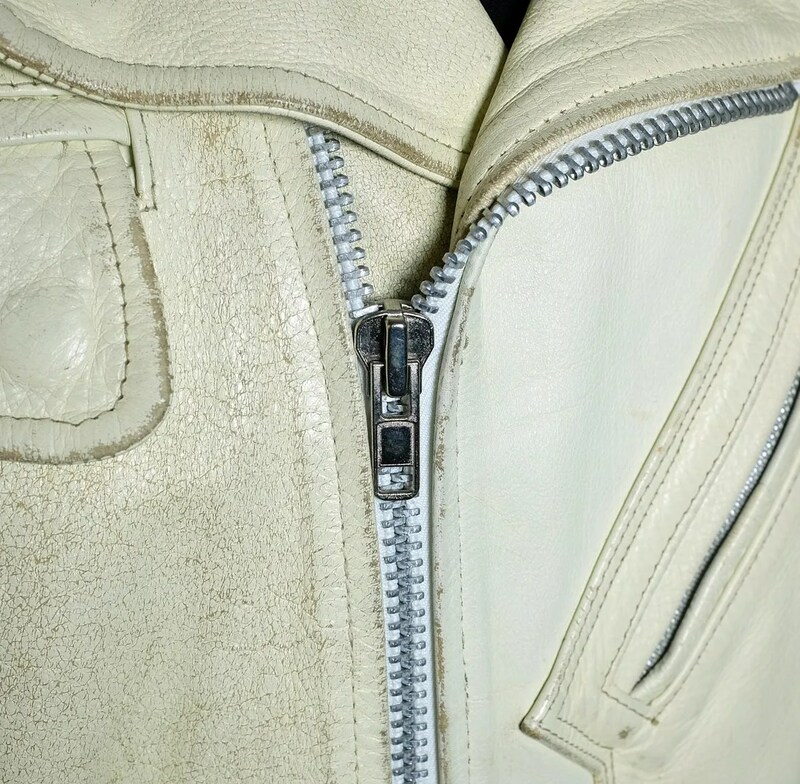 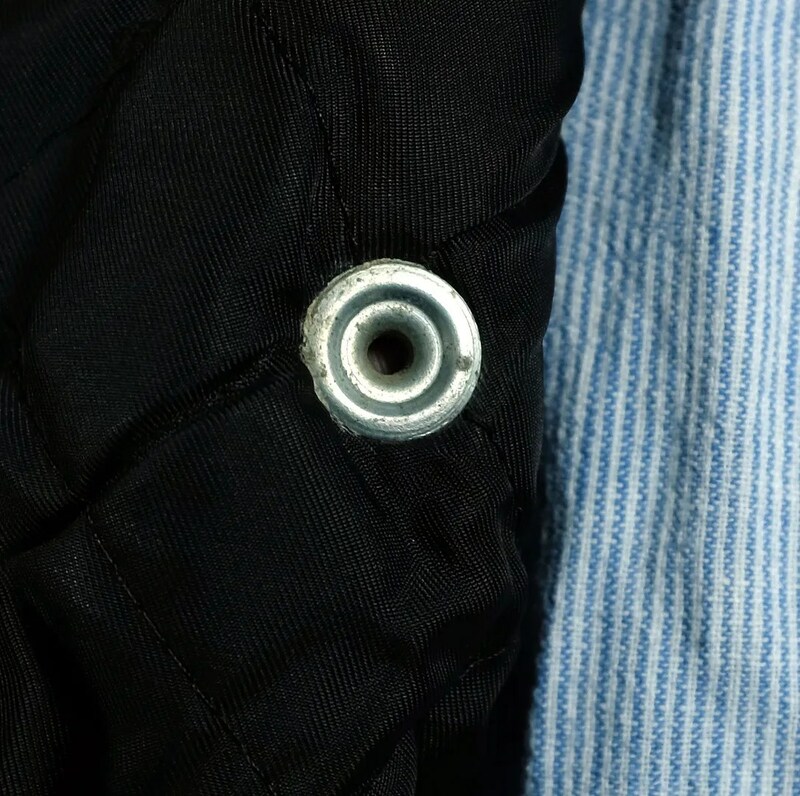 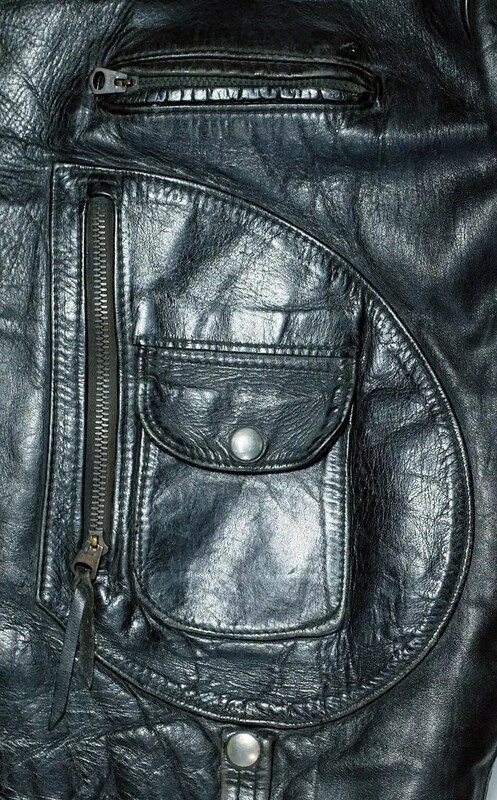 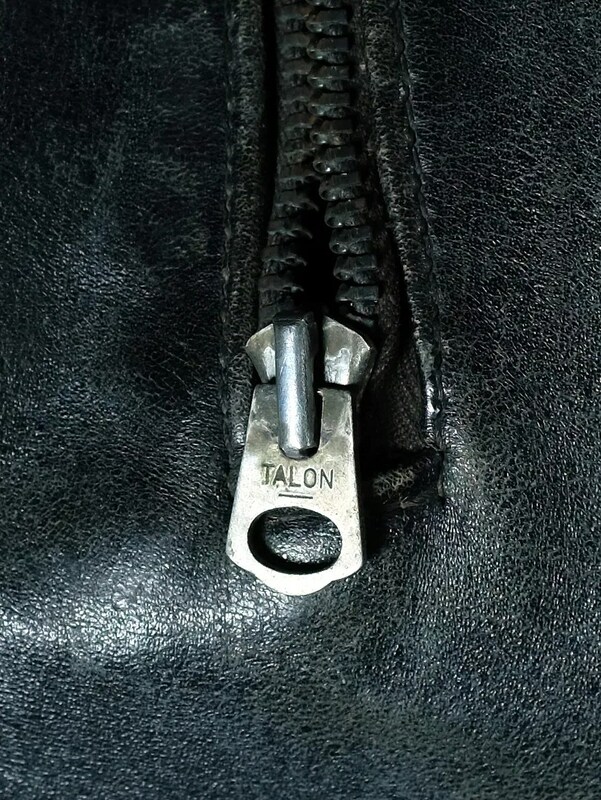 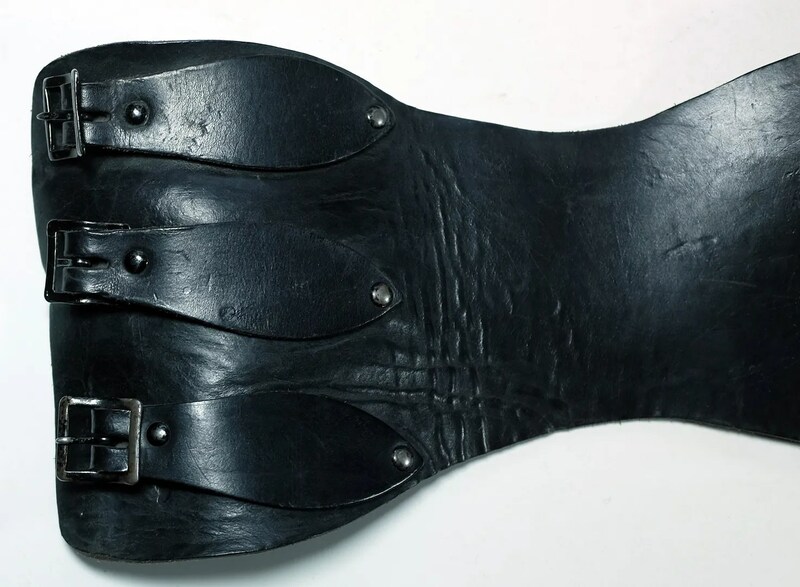 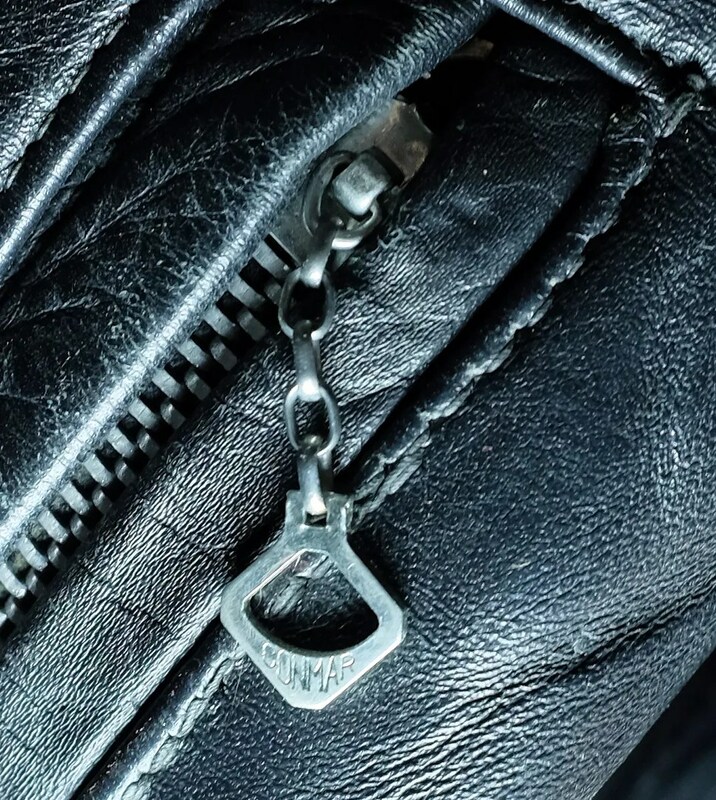 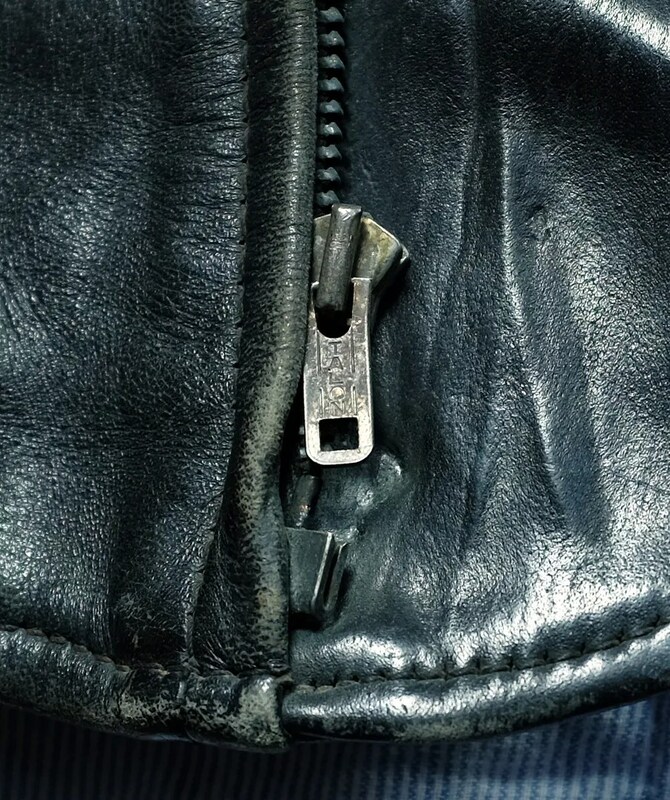 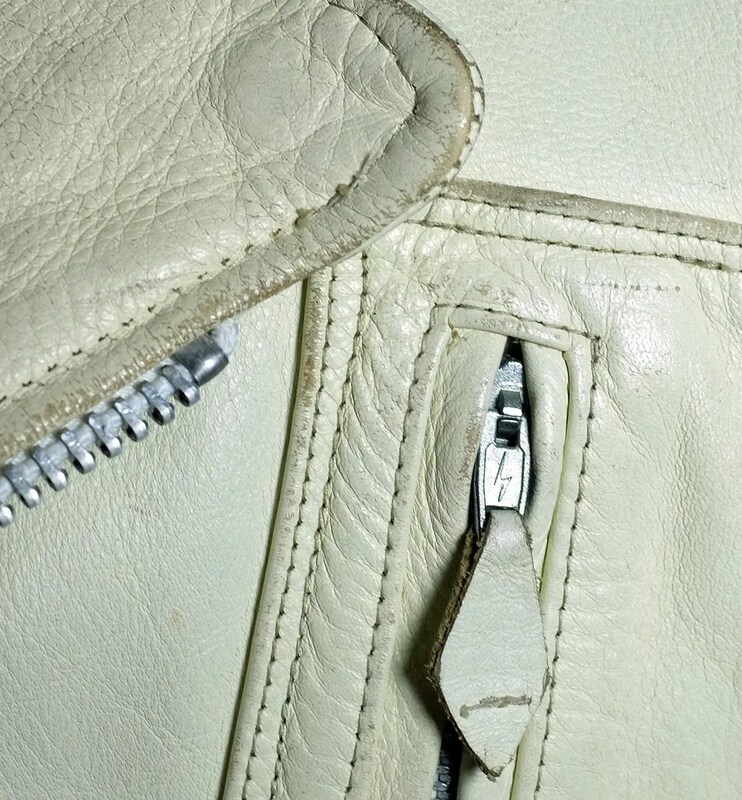 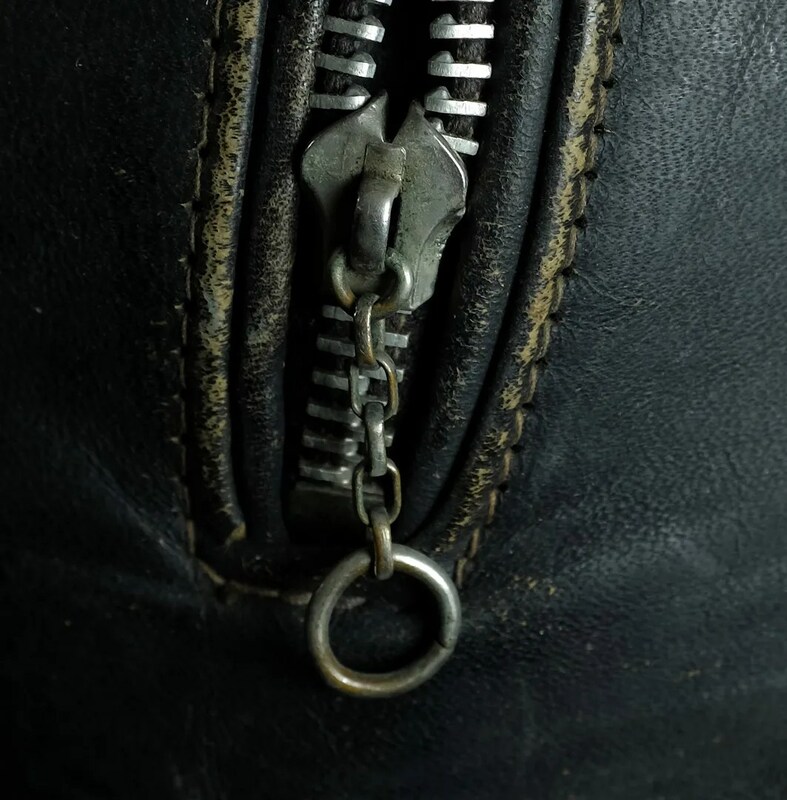 The main zipper is a Talon, of an design used in the early 1950s with a U shaped, wide rib, unmarked stopbox and square holed slider. 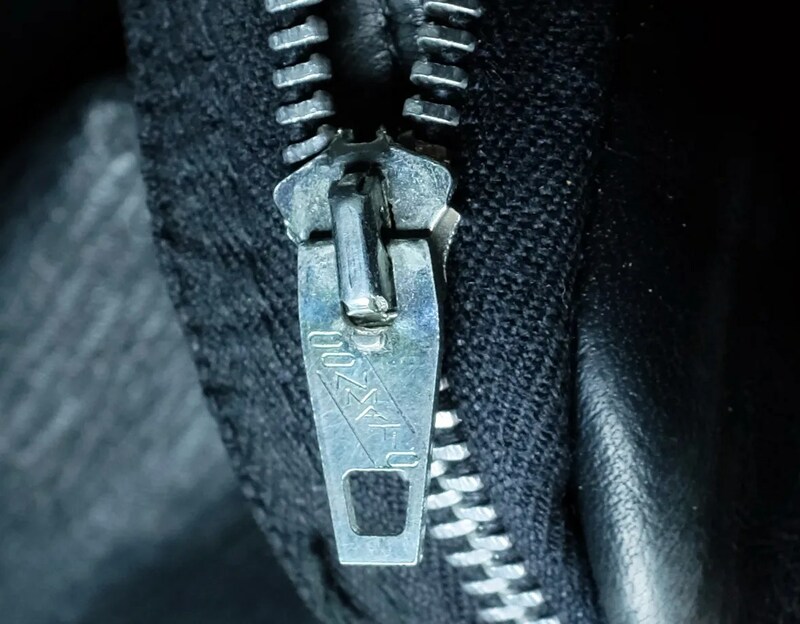 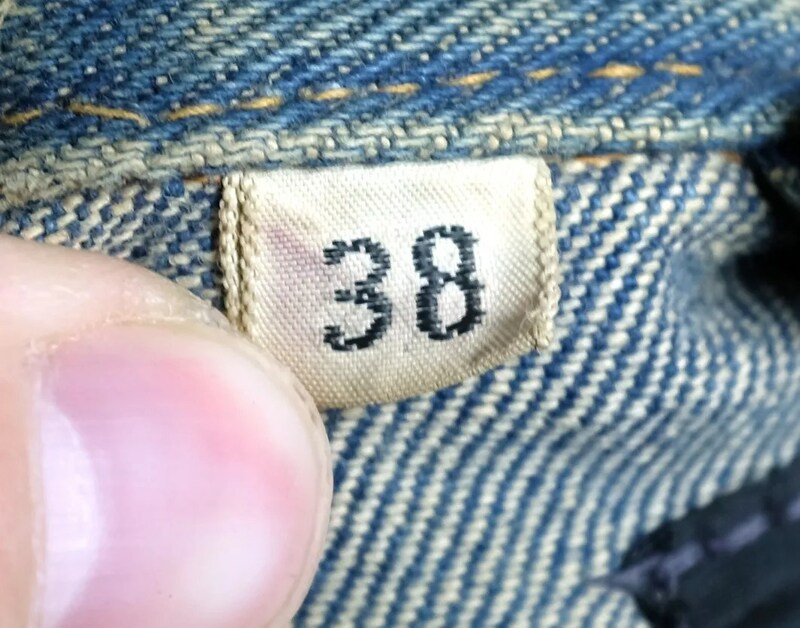 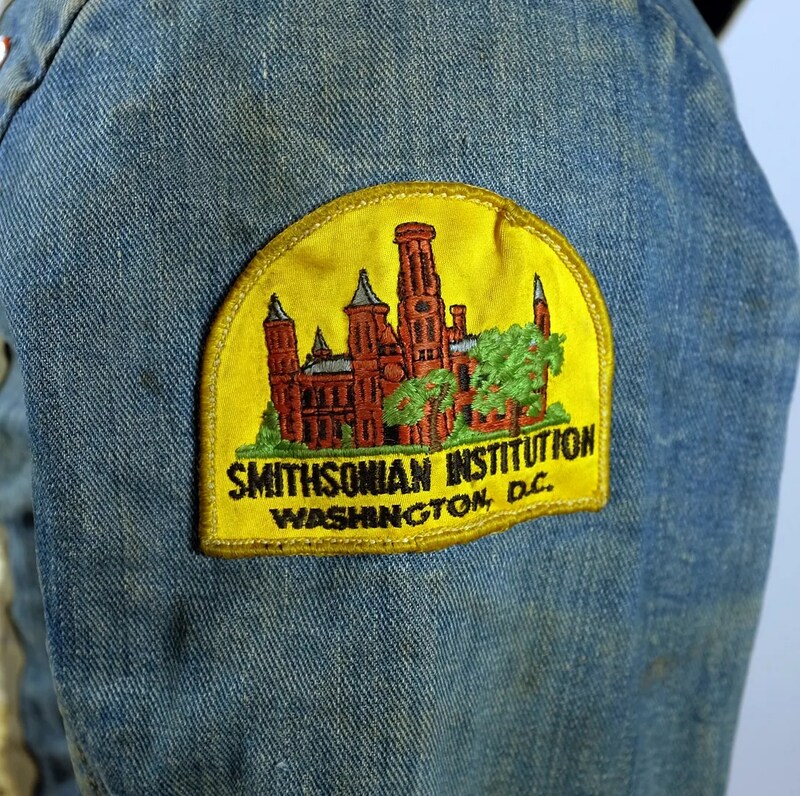 The bell shaped zips on the sleeves are unmarked. 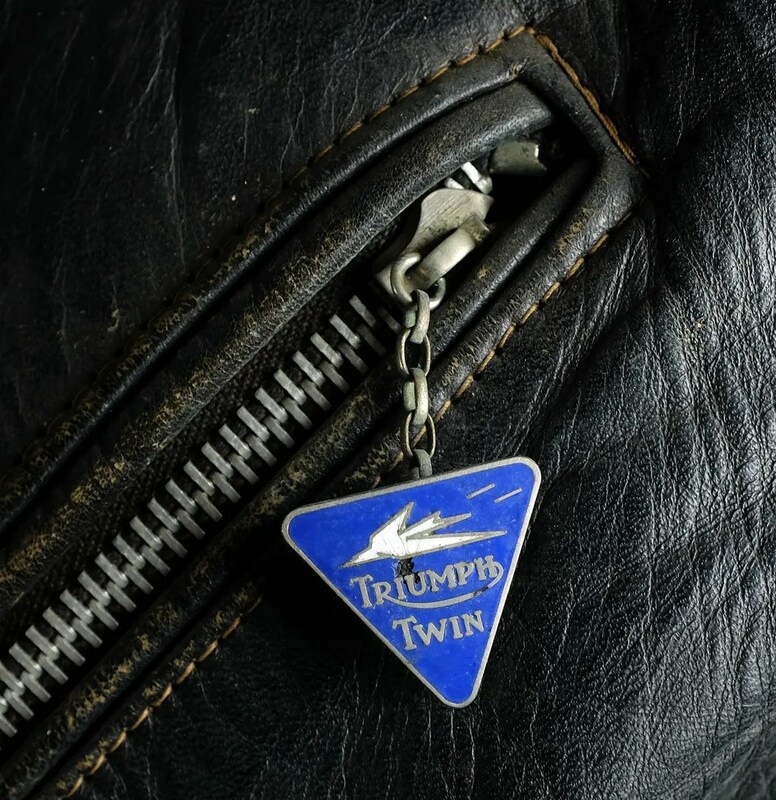 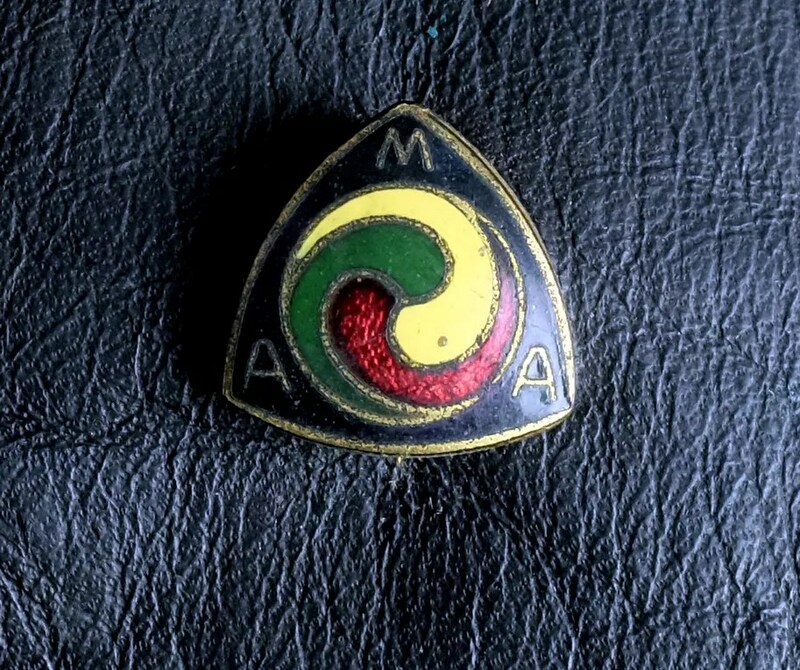 The chest pocket zip has an enamel Triumph Twin badge and the front of the jacket has an American Motorcyclist Association enamel pin. 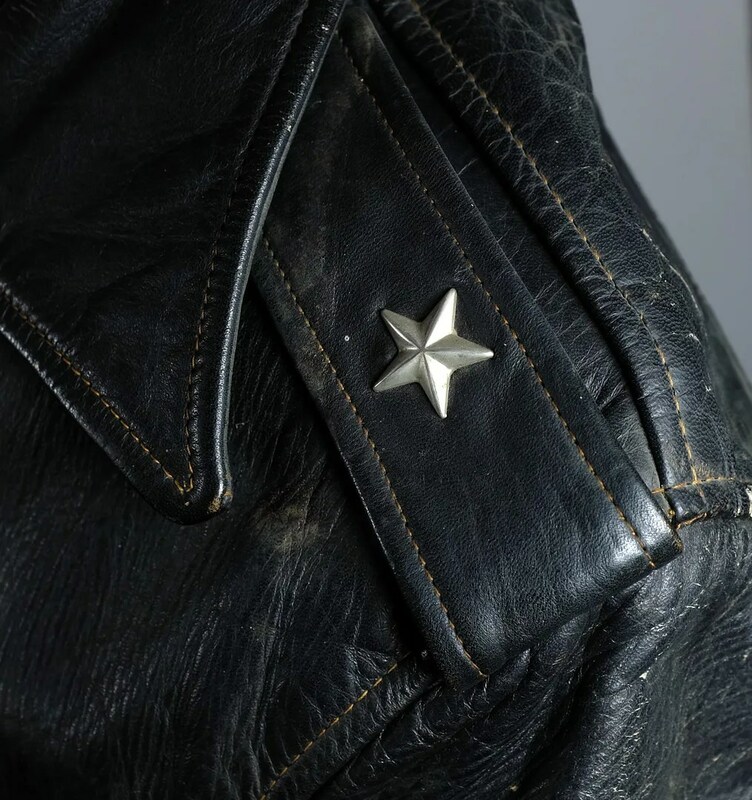 The epaulettes have star studs and the jacket has bi-swing shoulders. 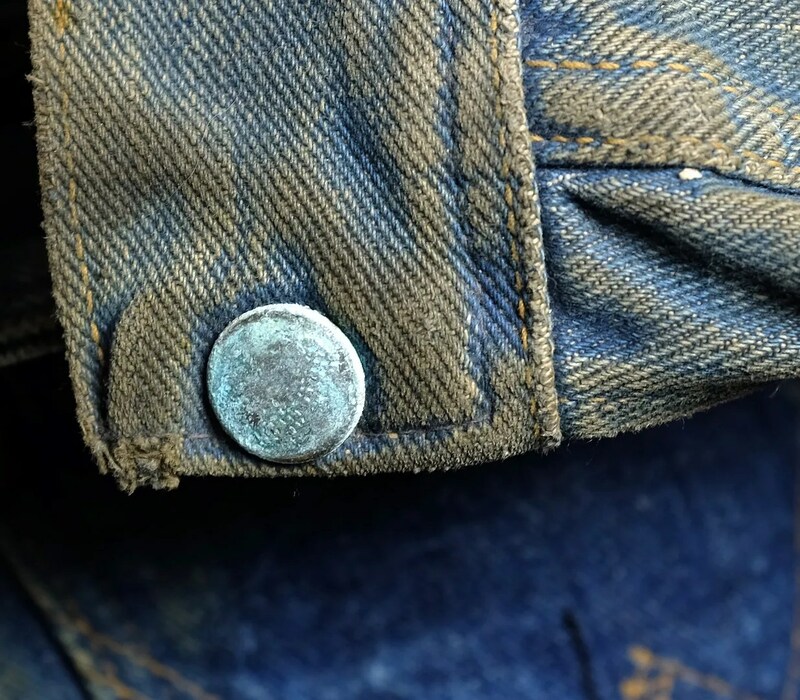 The back panel has developed an amazing grain. 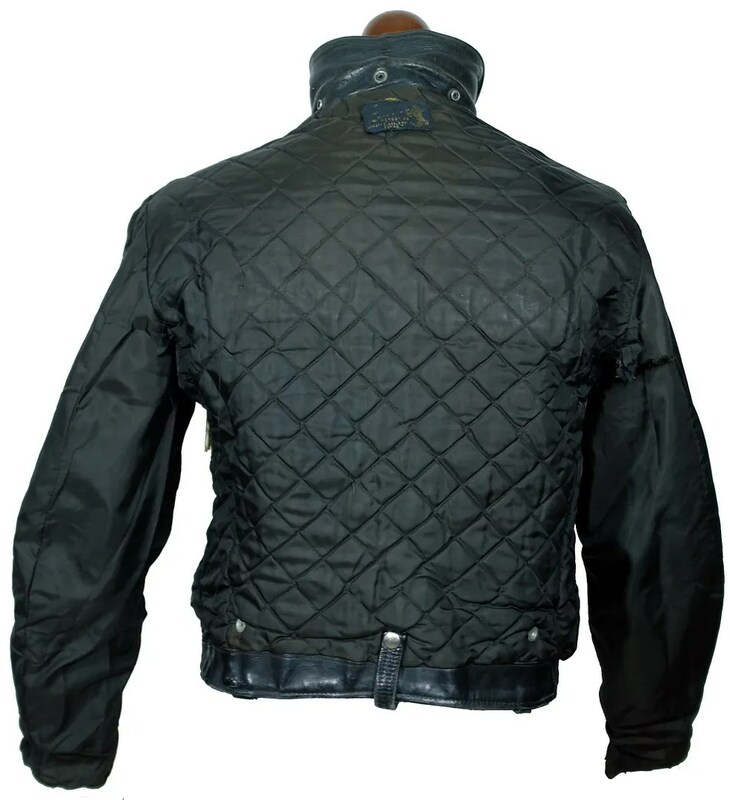 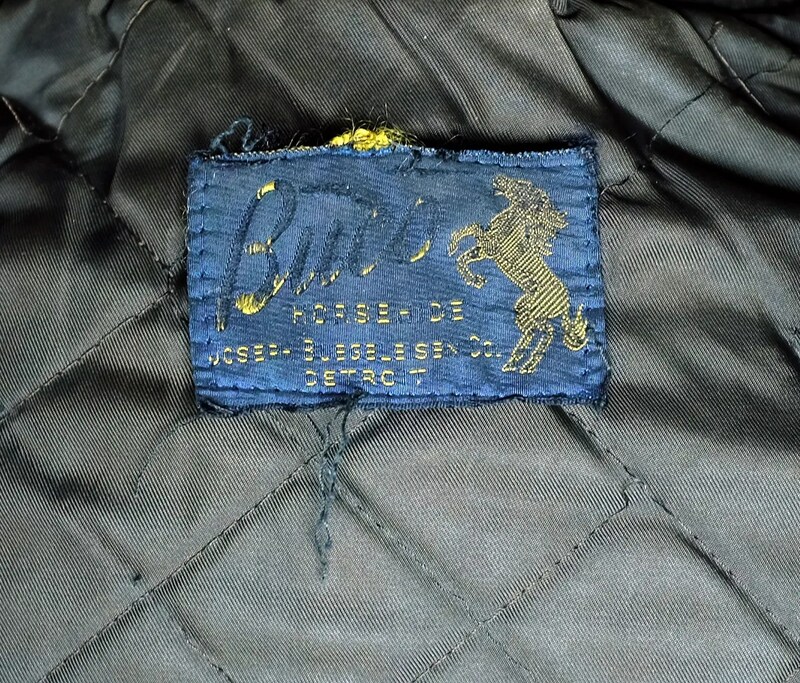 The jacket has a quilted lining. 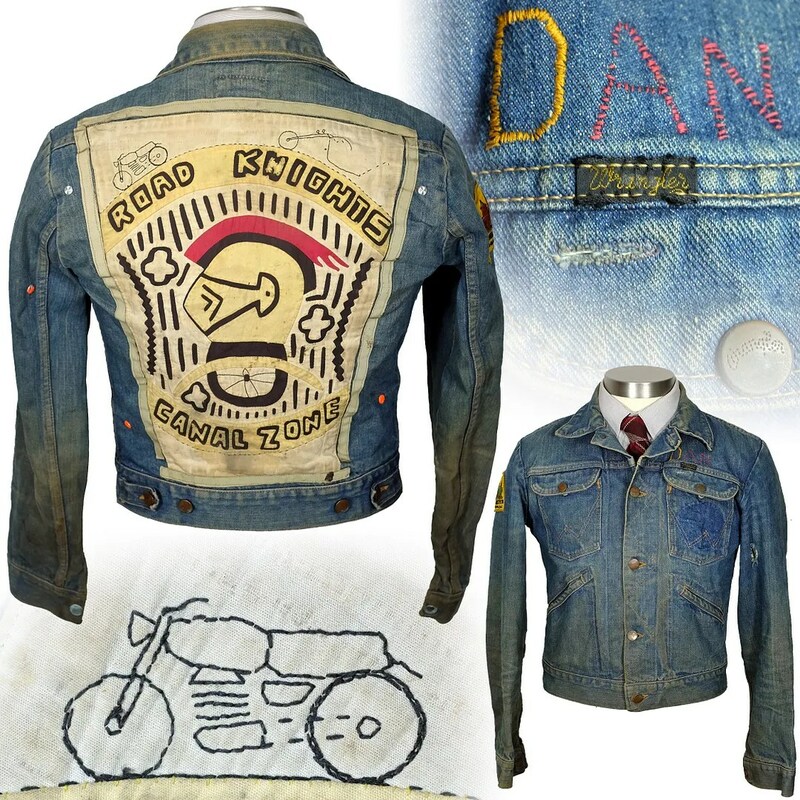 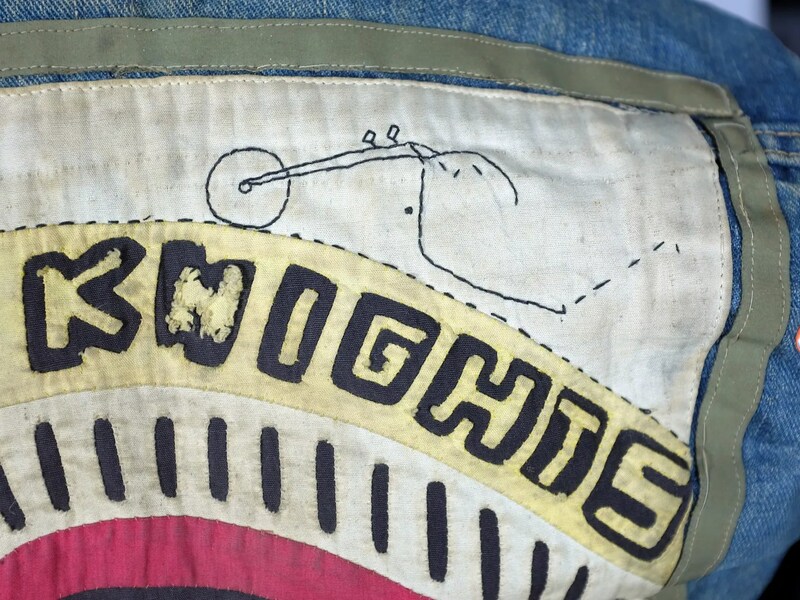 This jacket was made in the 1970s for Dan, a member of the Road Knights Motorcycle Club. 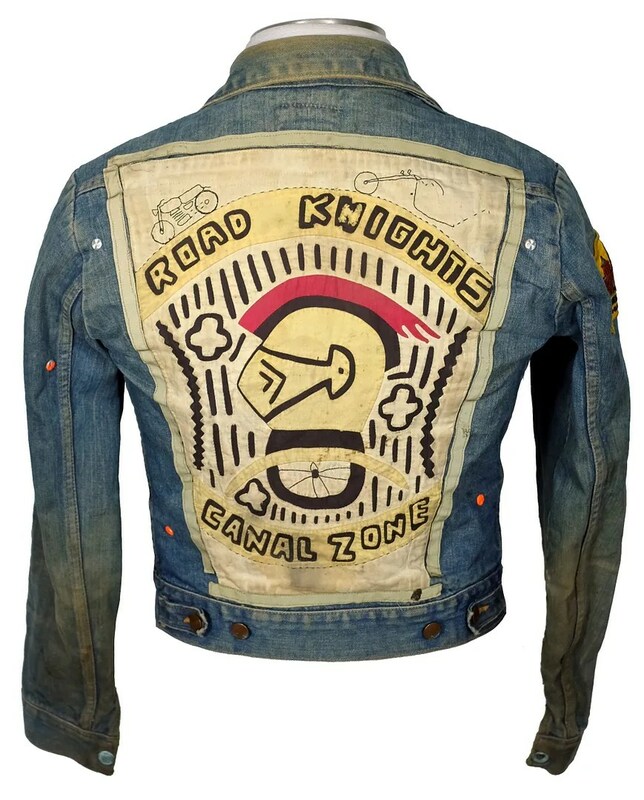 The Road Knights were founded in 1973 by members of the US Army stationed in the Canal Zone in Panama. 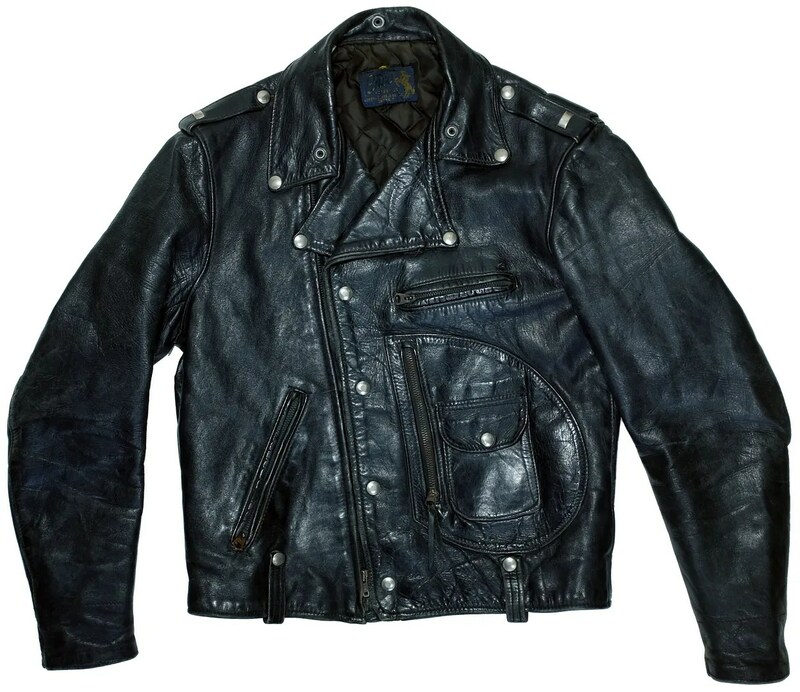 It is the oldest recognized motorcycle club in that country. 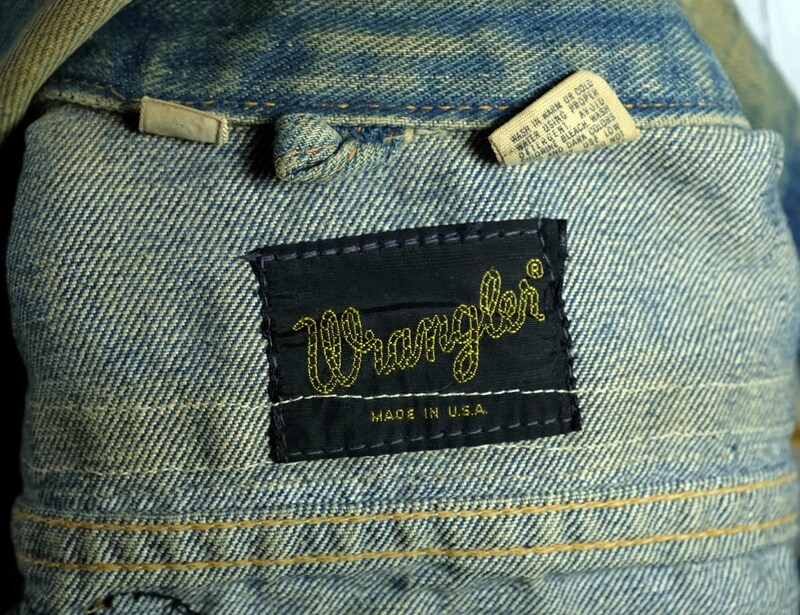 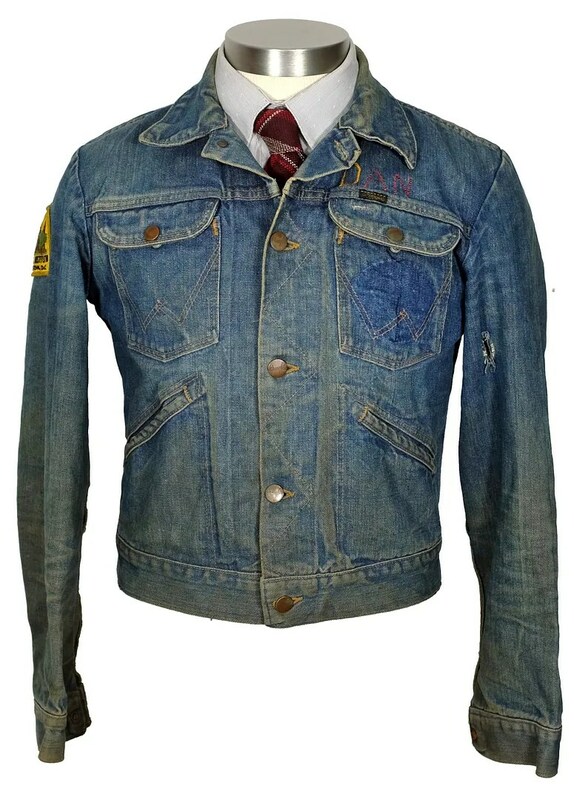 This jacket started off life as a Wrangler four pocket denim jacket, with snap pockets and cuffs and rivet button front. 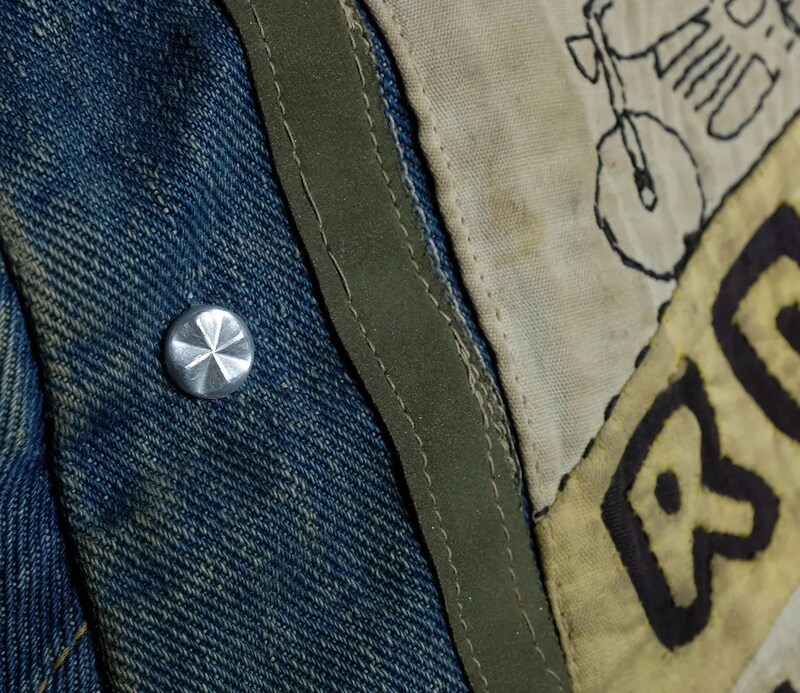 The colors on the back were entirely hand sewn, with reflective edging and studwork. 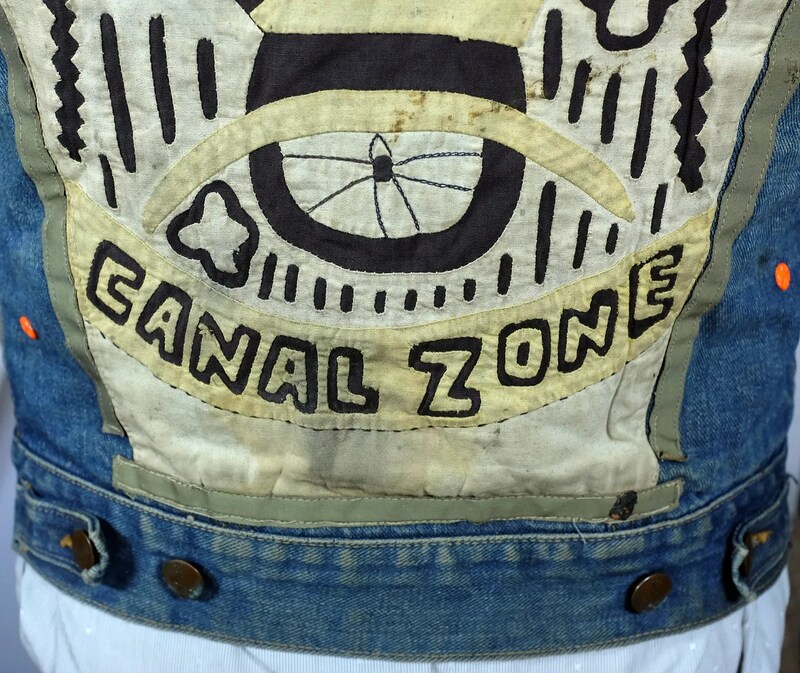 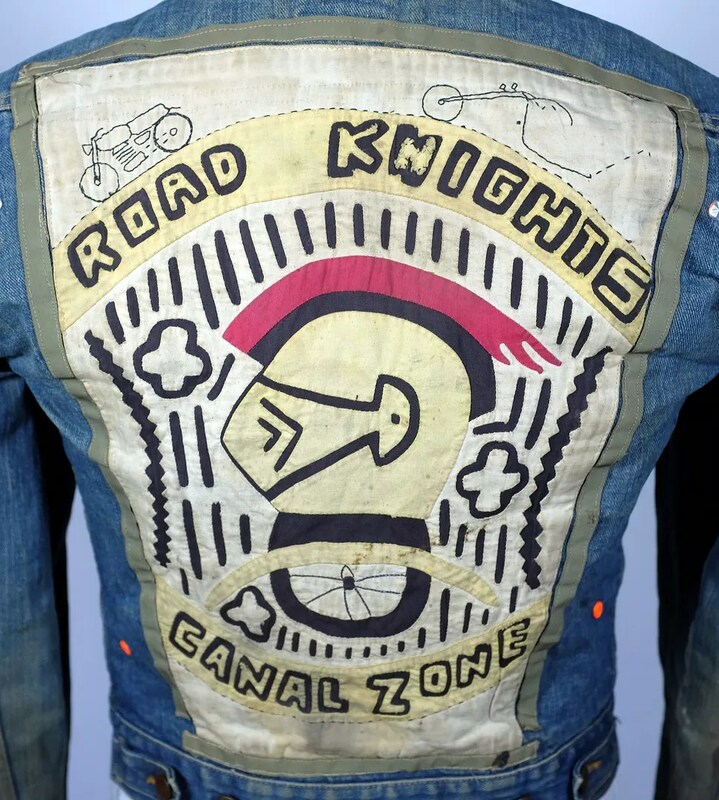 The rockers read, “Road Knights”, “Canal Zone” with a logo of a knights helmet atop a motorcycle wheel. 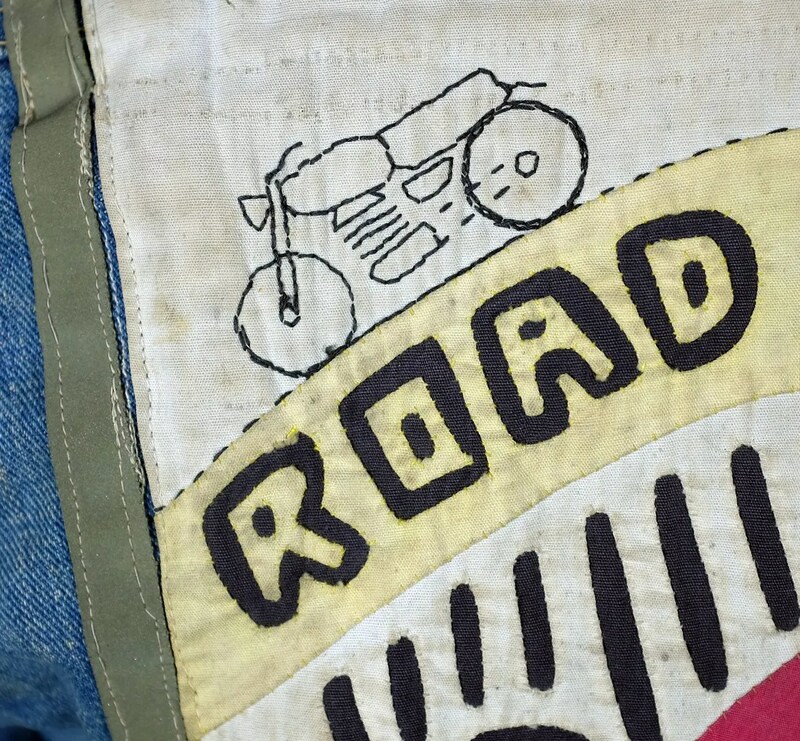 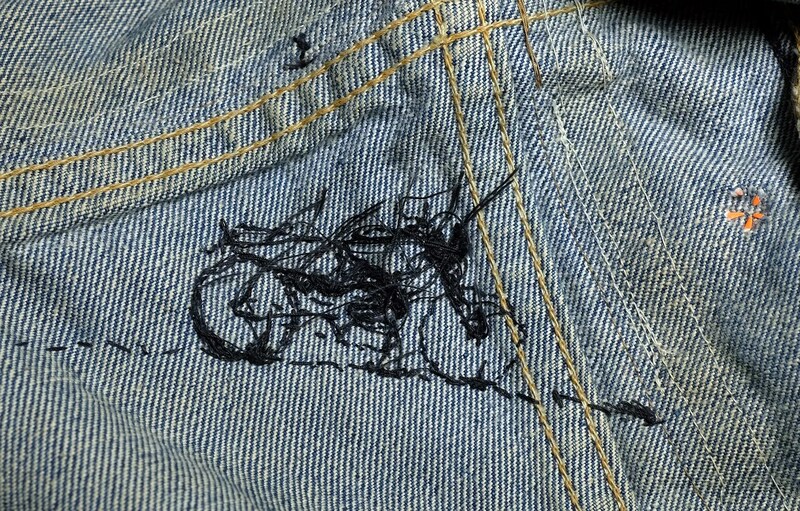 On top of the top rocker are two hand embroidered motorcycles, one a stock bike, the other a twin headlight chopper. 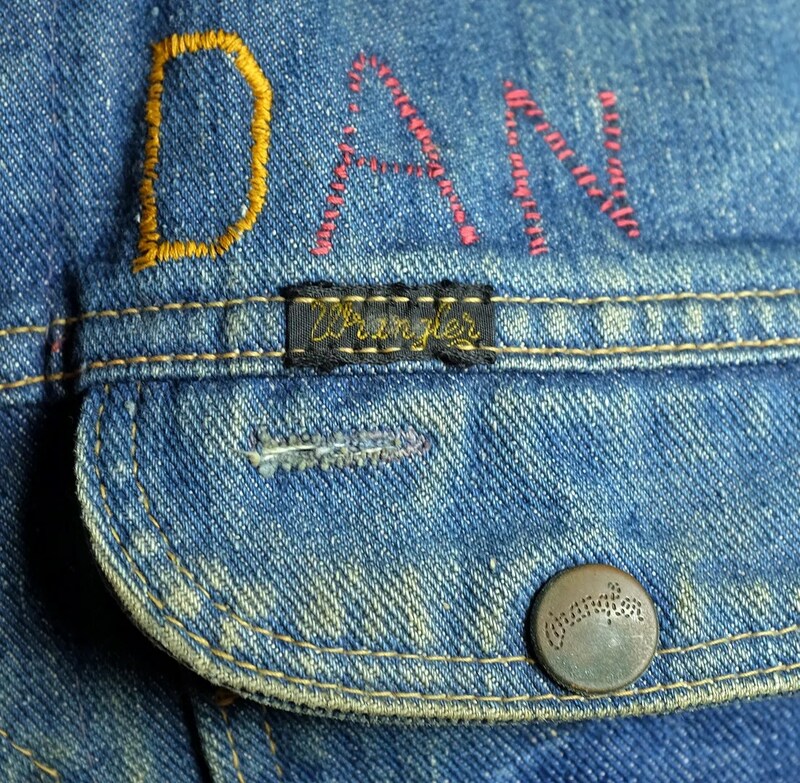 The owner’s name, Dan, is hand embroidered on the front. 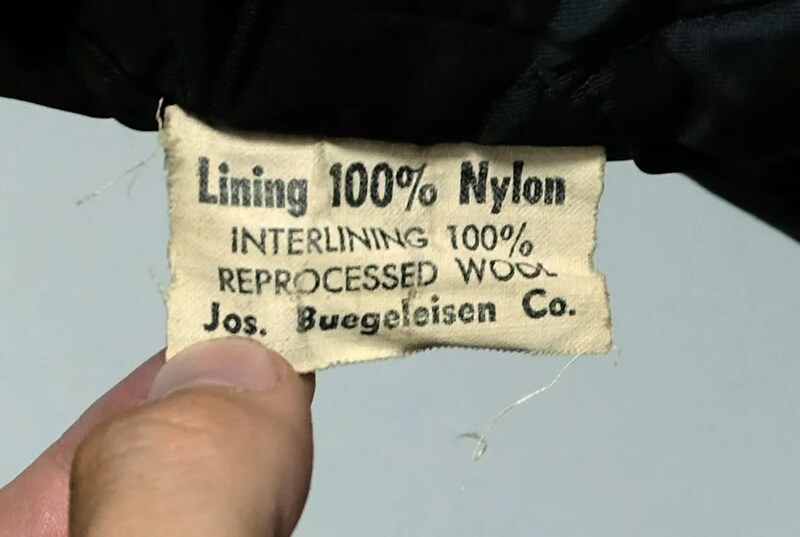 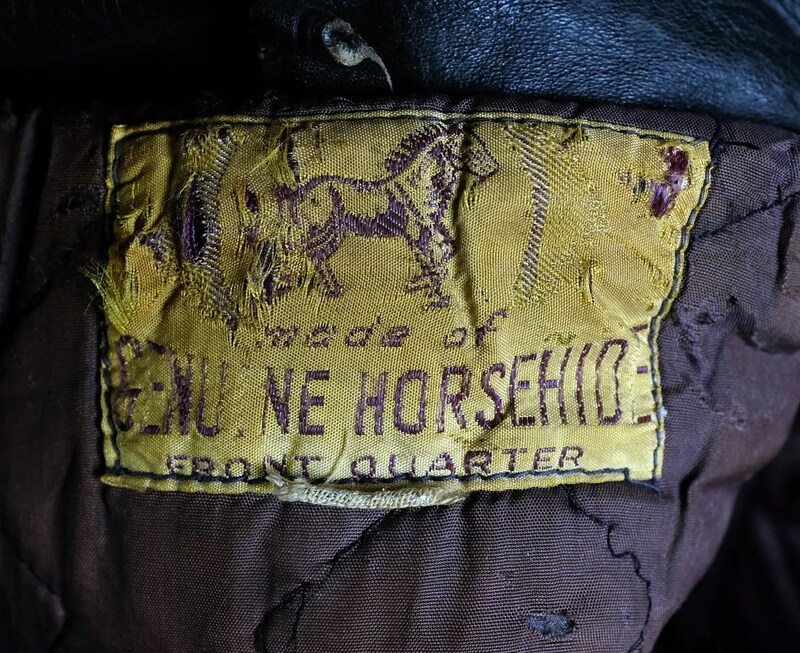 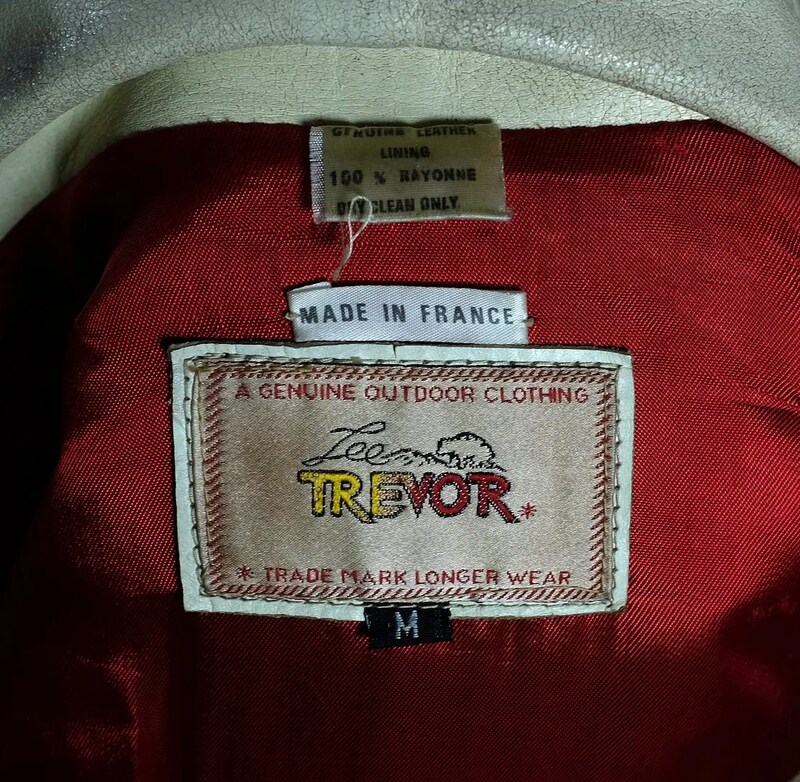 This vintage jacket was made in France by Lee Trevor Genuine Outdoor Clothing. 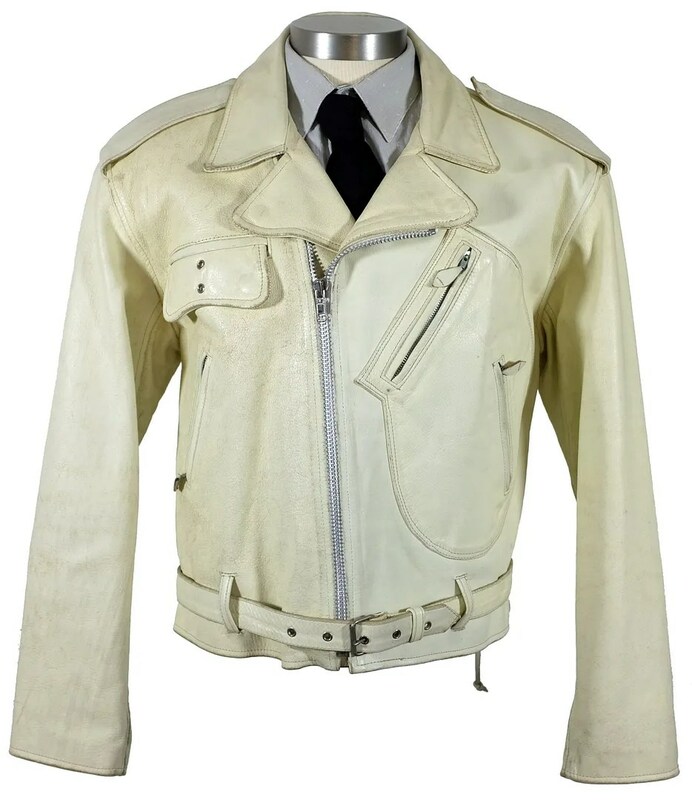 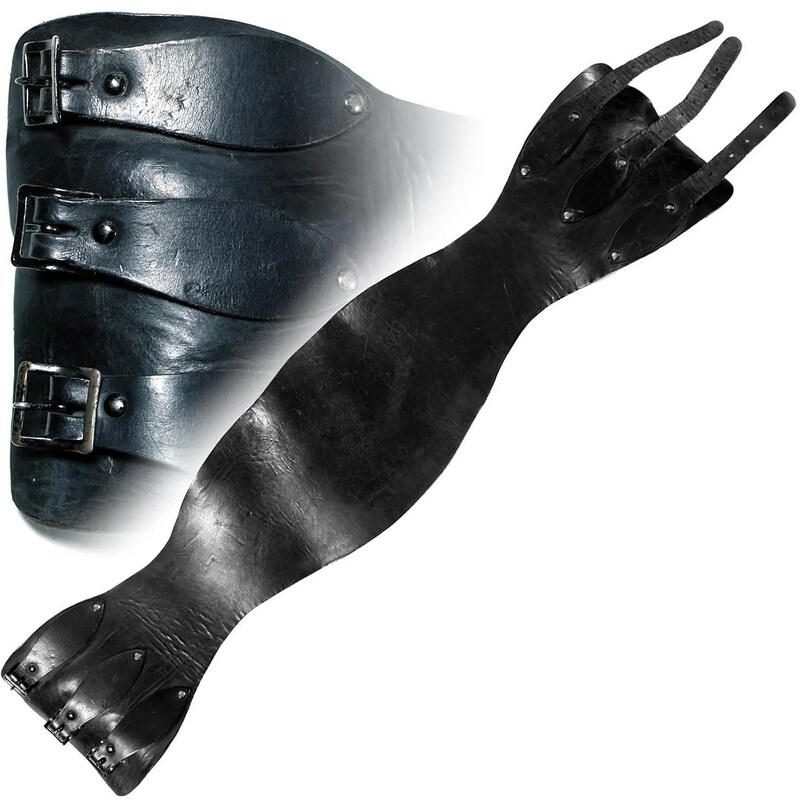 It is made of heavyweight leather in a bone color. 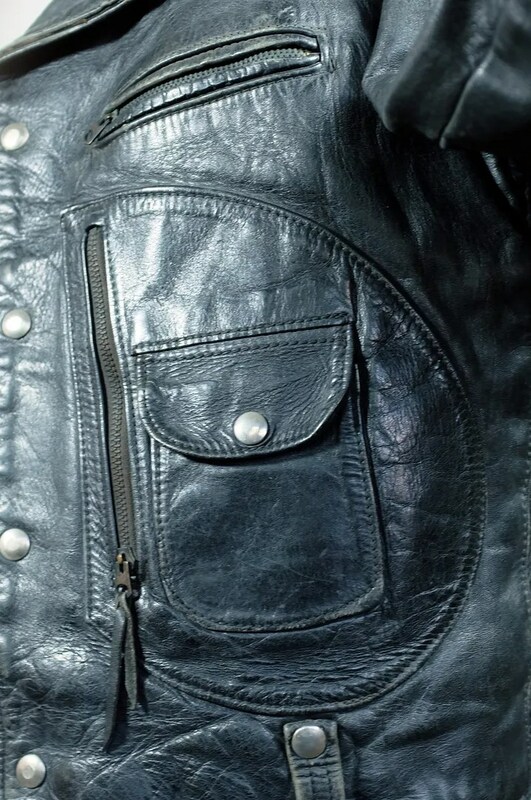 It has a large D-Pocket map pocket, handwarmer pockets and a flapped breast pokets with grommets in the same style as badge holders on police jackets. 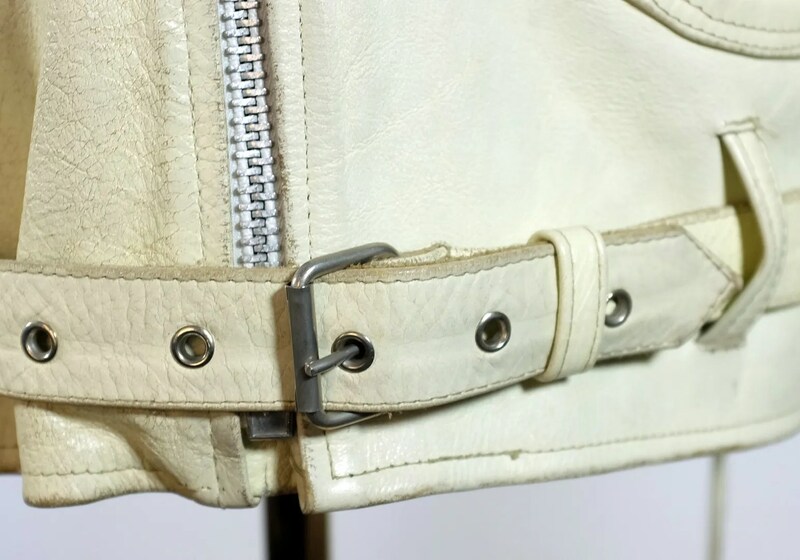 There are zippers on the sleeves, an attached belt, and lace-up side adjusters. 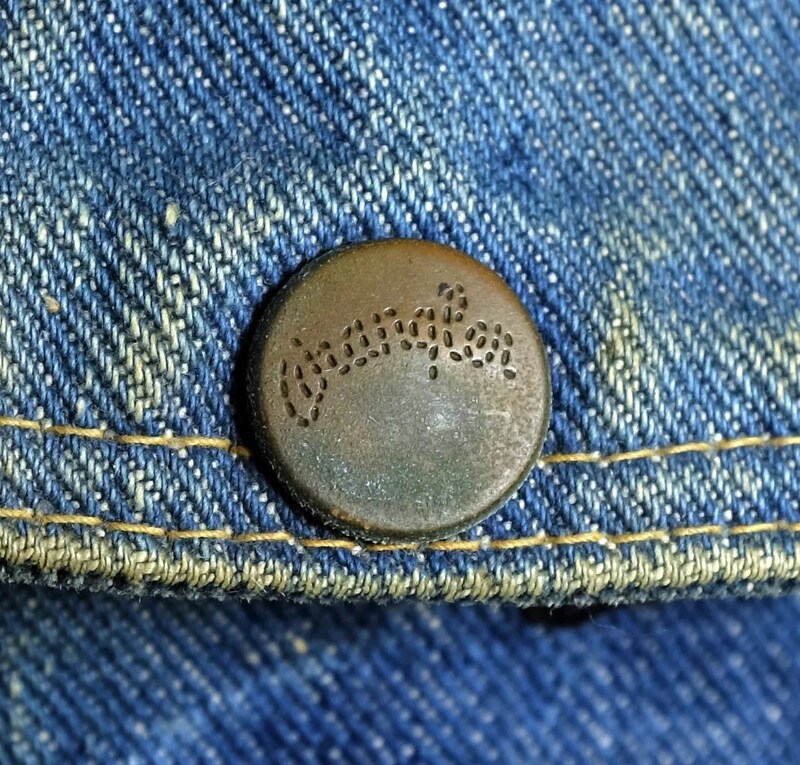 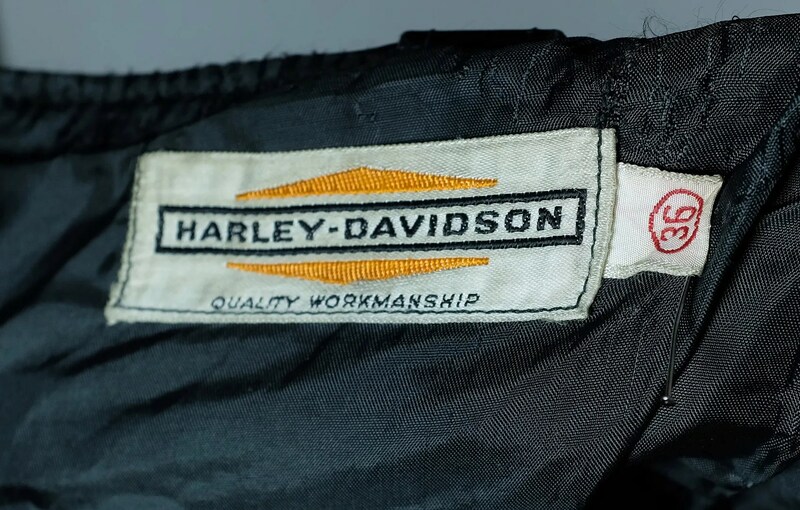 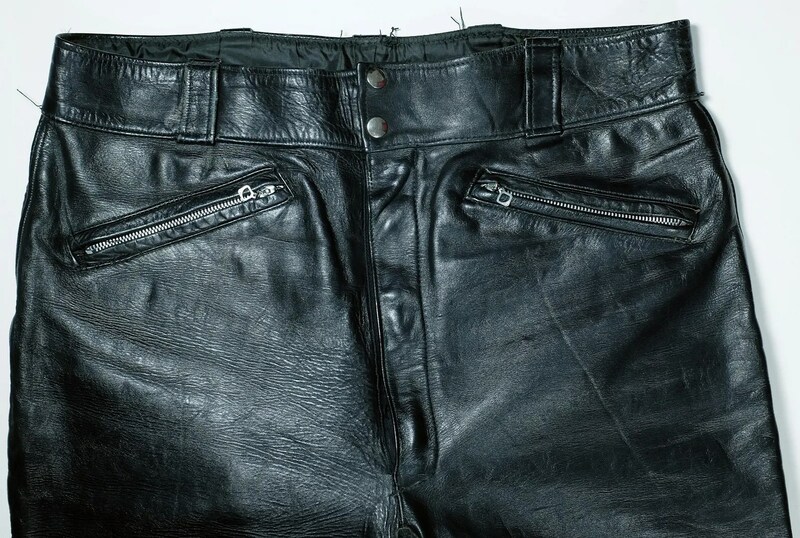 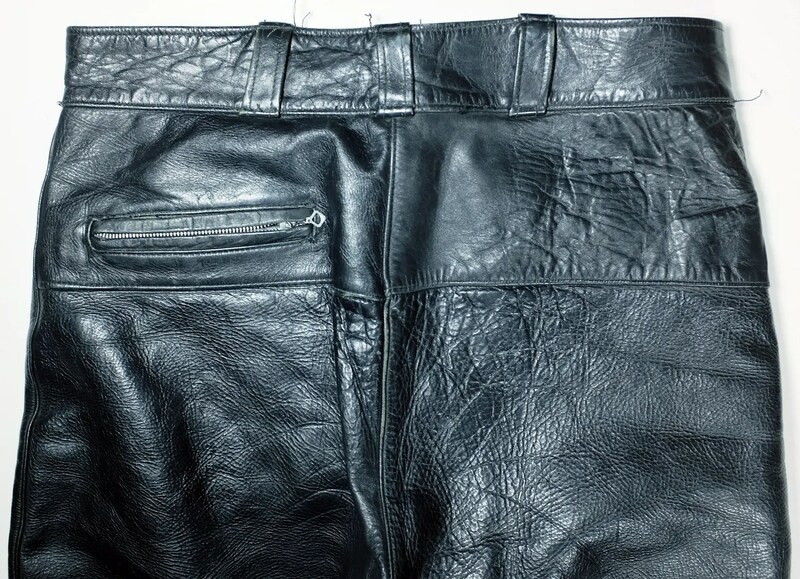 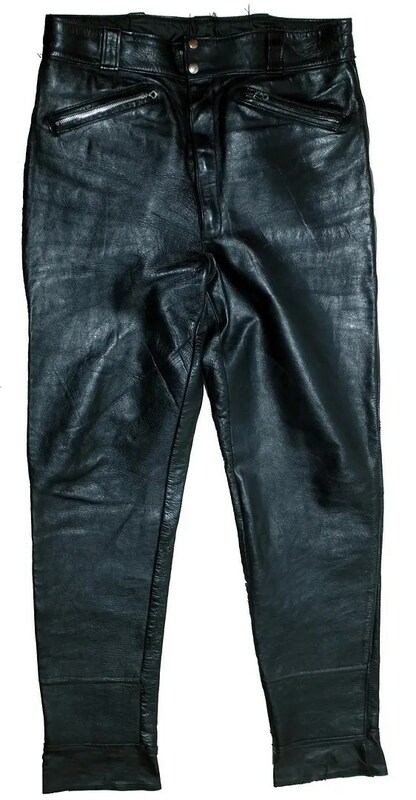 These vintage pants were made in the 1960s for Harley-Davidson. 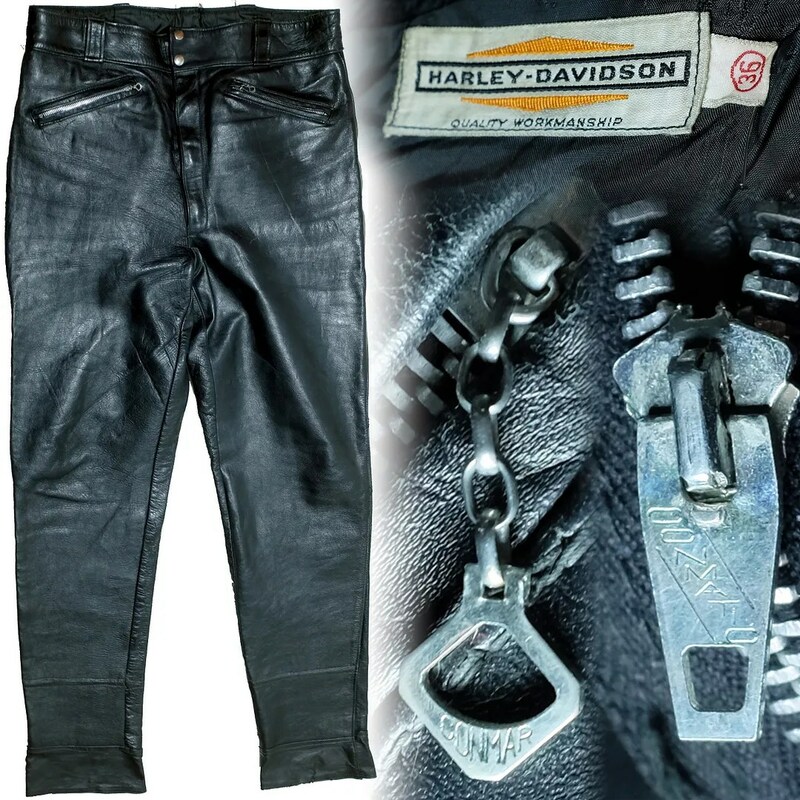 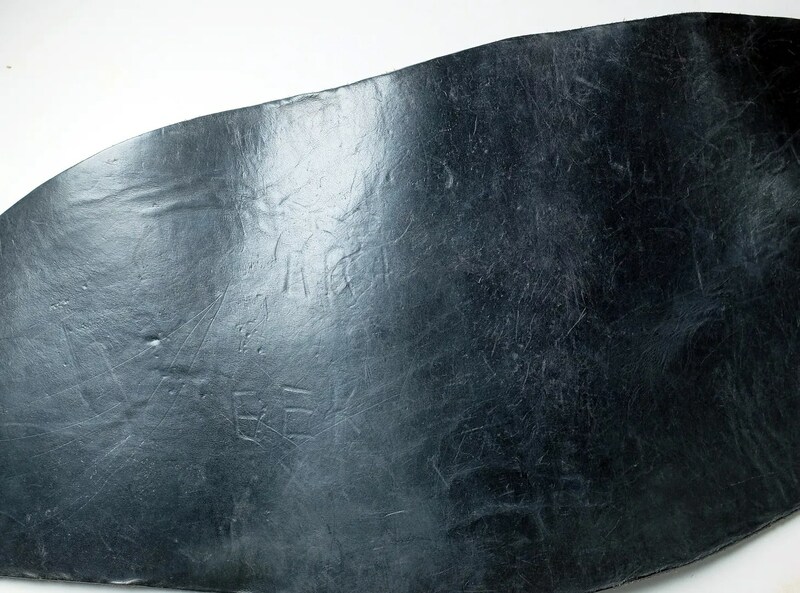 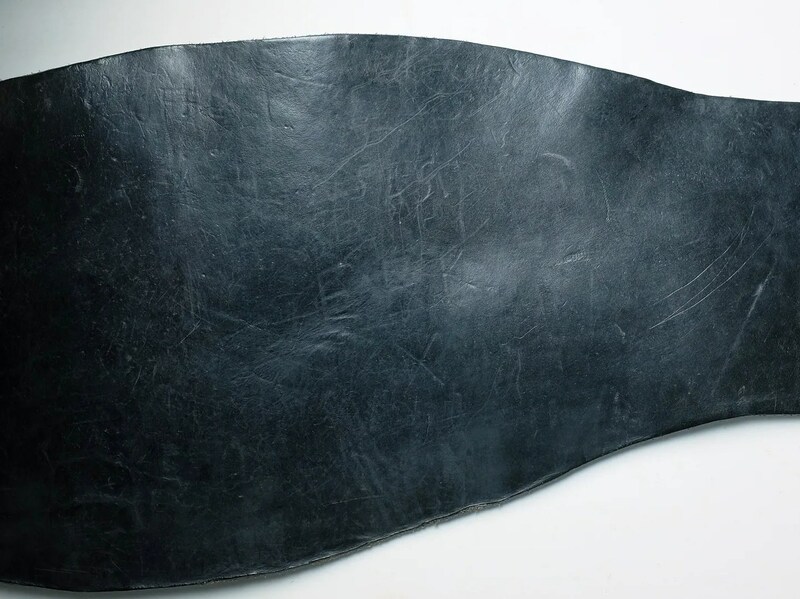 They are made of heavyweight black leather with an absolutely killer grain. 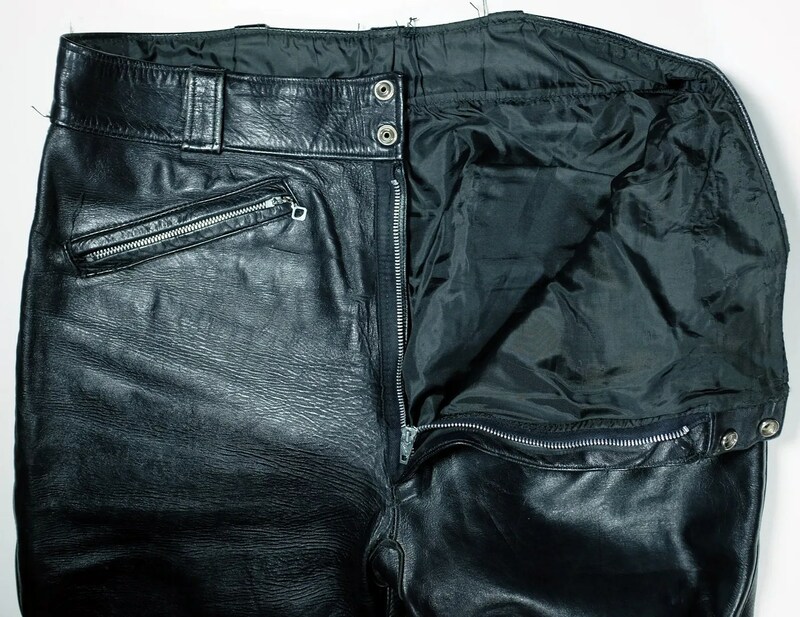 They have a double snap waistband, heavy jacket size Conmar zipper fly and diamond pull zipper pockets. 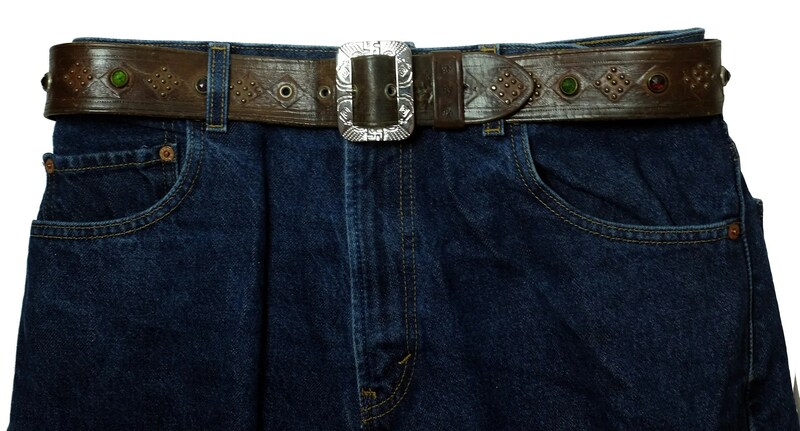 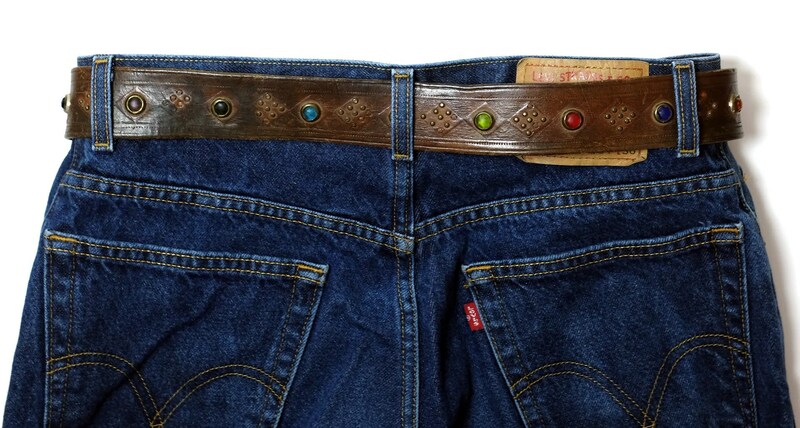 This vintage kidney belt has a classic riveted, three buckle design. 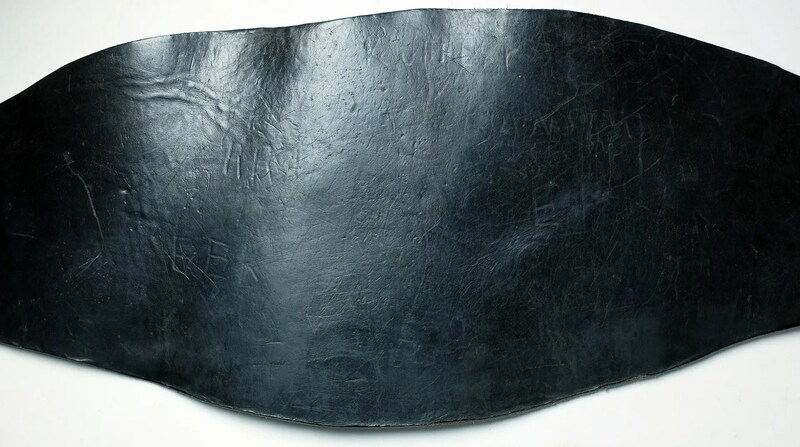 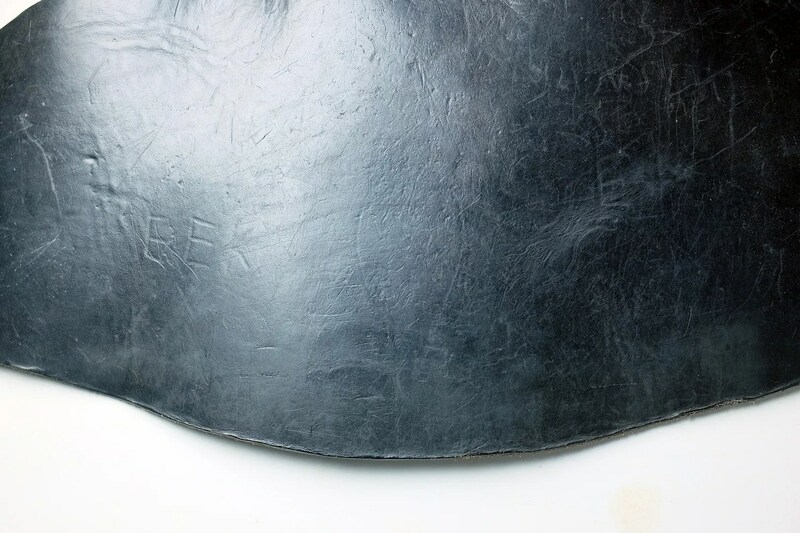 The original owner has tooled in a heart in the center and sets of initials, though all the writing is now faint.